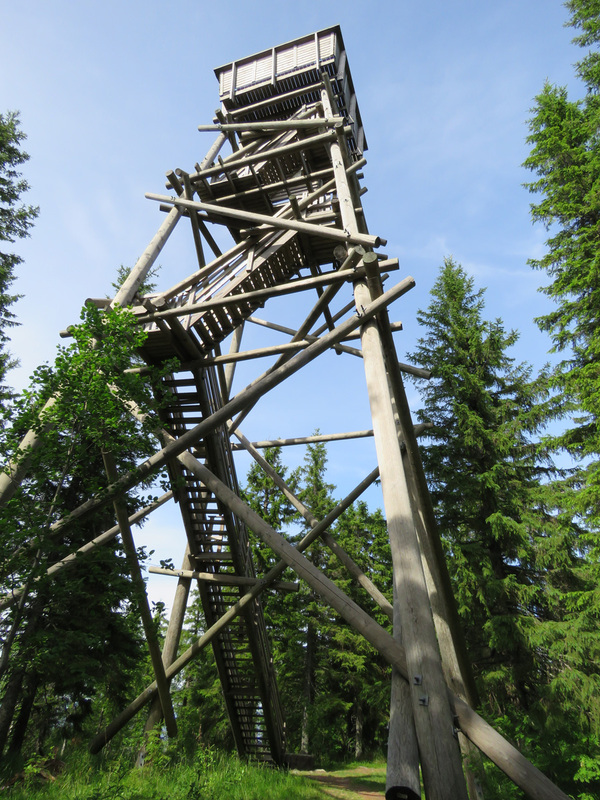 It has become a habit to make a trip in the summer, so I made one this year as well. 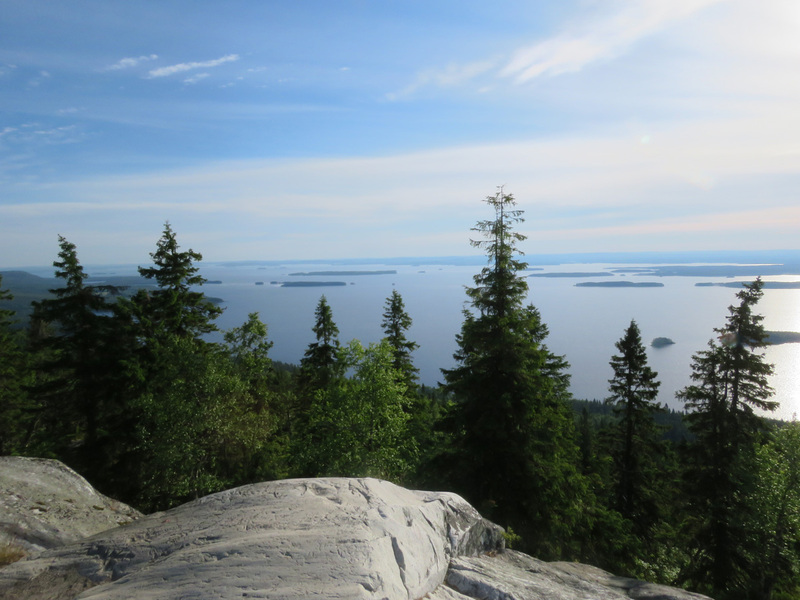 Because last year it was so foggy in Koli National Park, I wanted to go there again, hopefully in better weather. 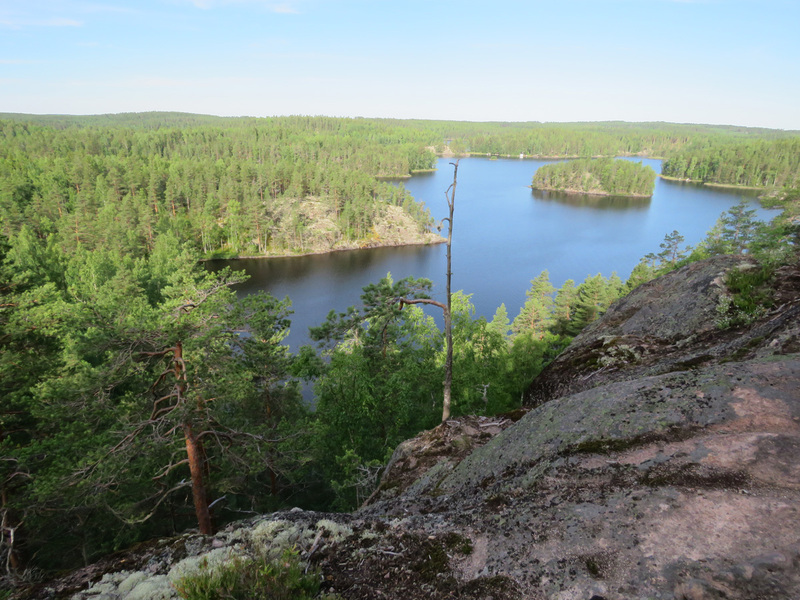 On the way I visited Arboretum Mustila for the first time and after Koli I went to the National Parks of Patvinsuo, Leivonmäki and Repovesi. 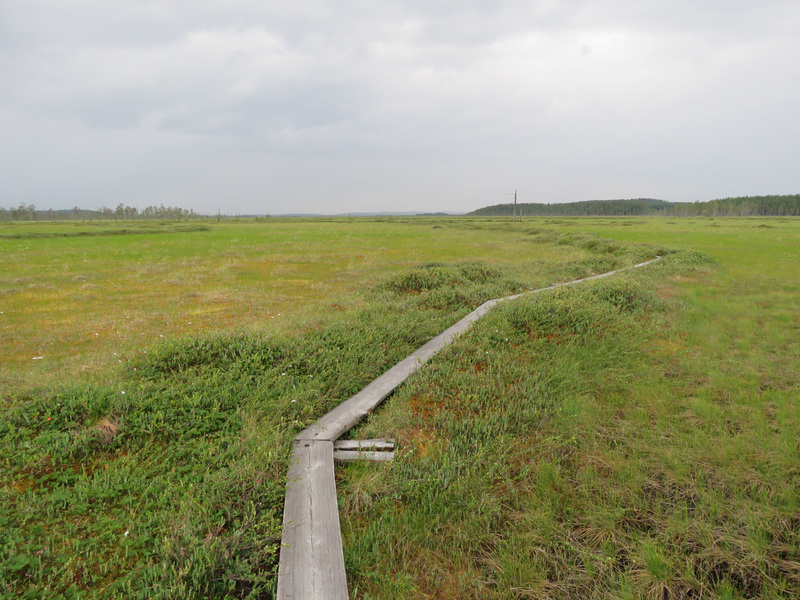 The numbers in the left margin of the journal are the distance I drove (in kilometres). 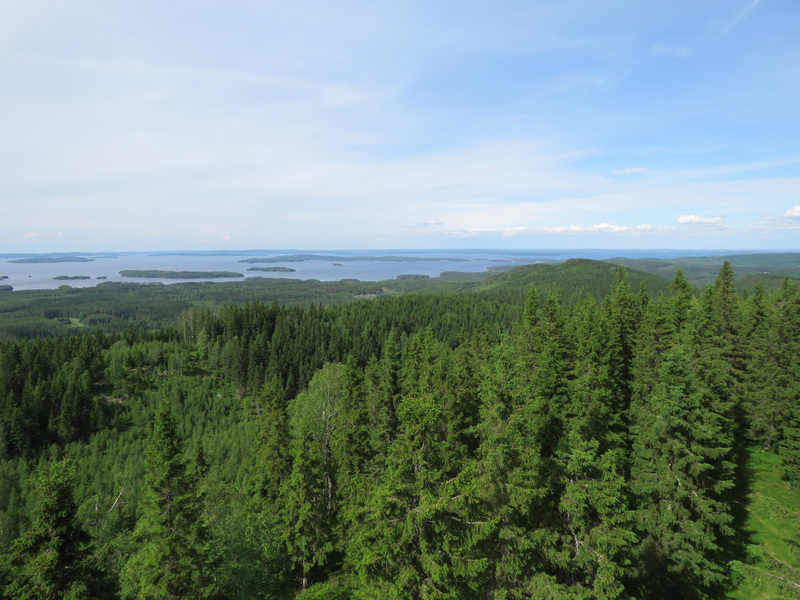 Unfortunately I managed to make this post only one year after the trip. 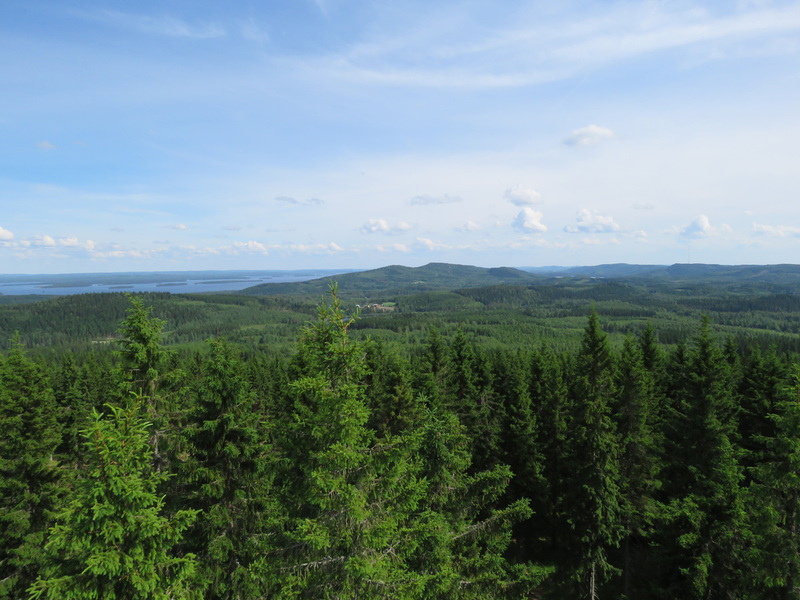 On Monday morning I went to pick up the rental car, packed, and started driving. 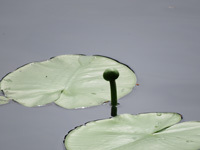 I arrived to Mustila later in the morning and walked around the arboretum for a couple of hours. It was a nice place. 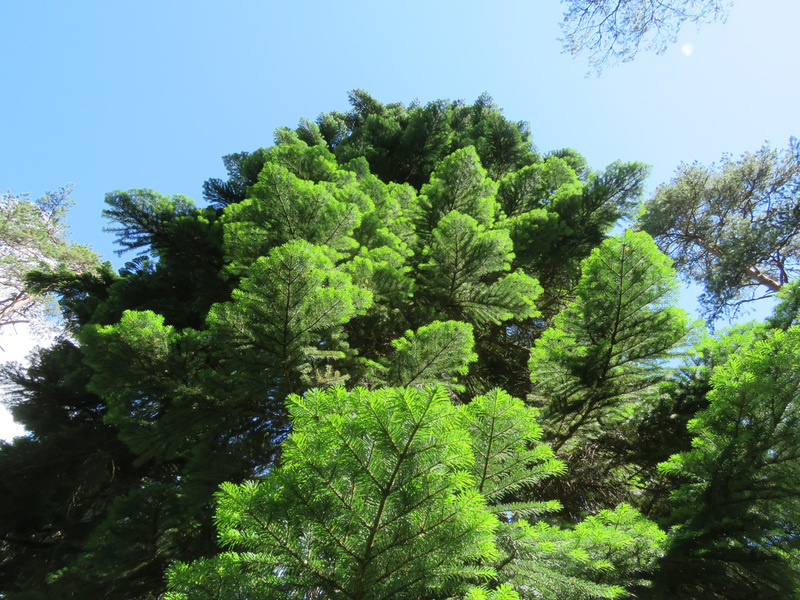 I didn’t take many photos, but here’s one of a Pacific silver fir (Abies amabilis) that was planted in 1910. 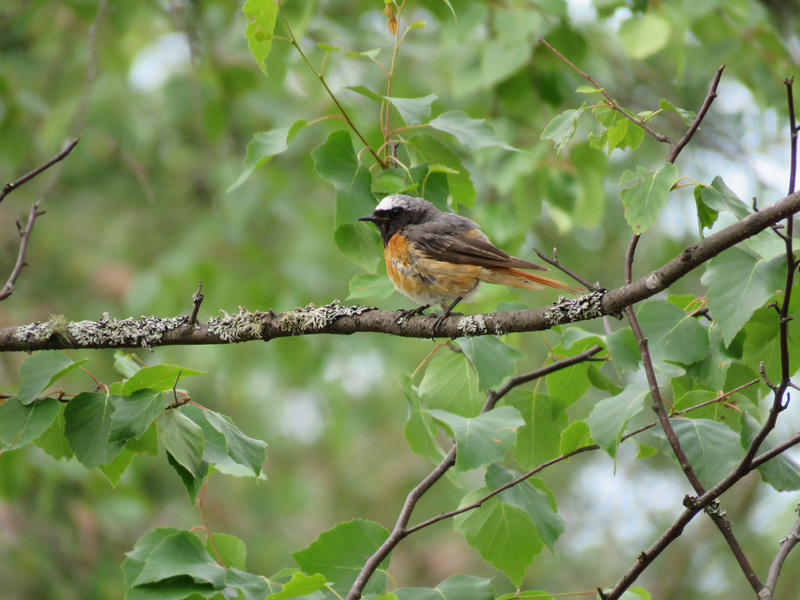 On the way to Koli, I had a couple of short breaks. 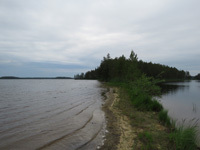 When I got to Joensuu, I went to the store to buy food. 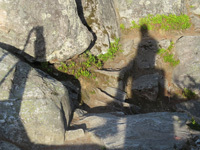 On the way I had had too little food and water and the sun had shone all the time. 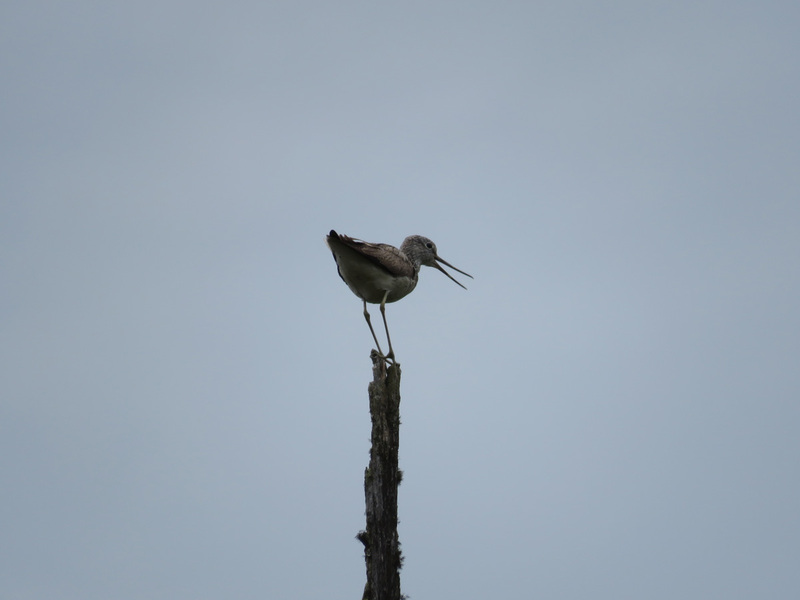 I tried to eat more now, but the food came back up. 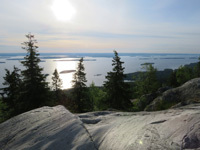 At nine in the evening I arrived at the parking lot of Koli. 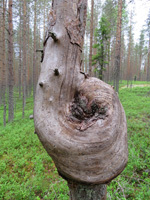 I didn’t feel sick anymore. I didn’t go for a swim even though I had planned to do so, but went straight to the camping site. 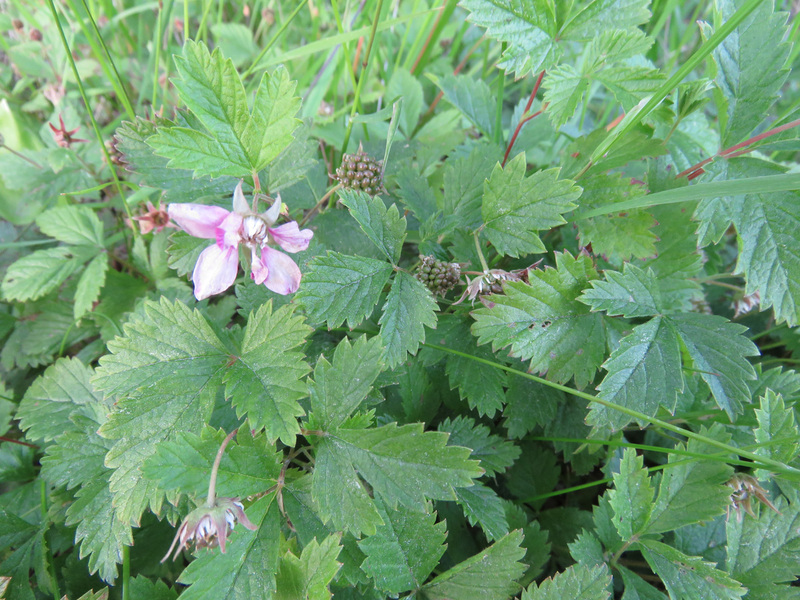 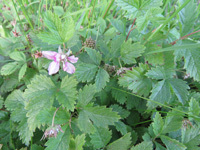 While walking there, I saw flowers and unripe berries of Arctic bramble (Rubus arcticus). 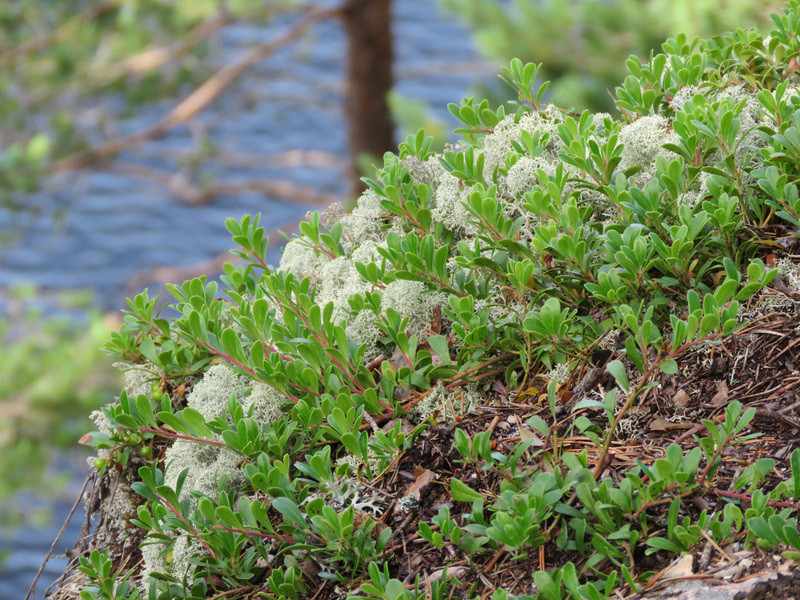 Too bad they weren’t ripe yet, I have never tasted a berry of an Arctic bramble. 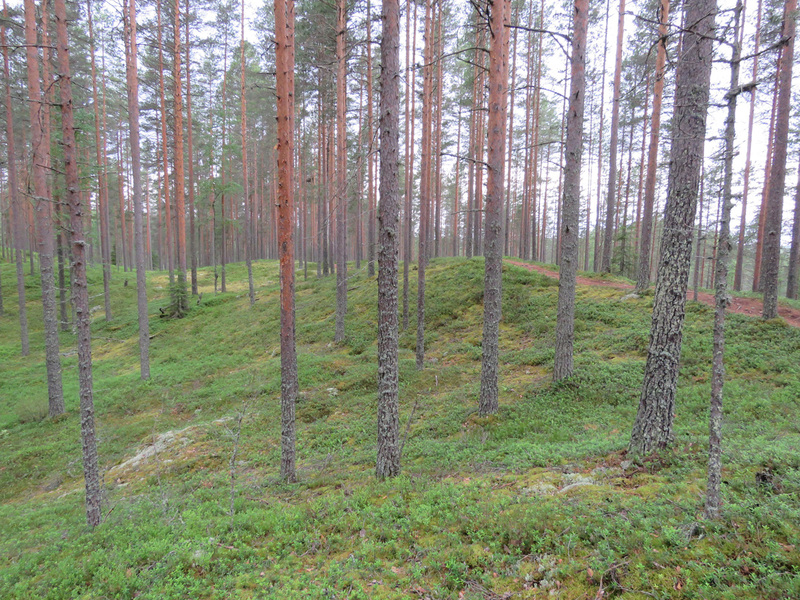 I went to sleep in about the same spot where my tent had been the year before. 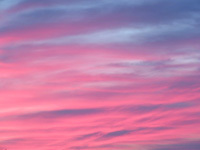 I woke up at five. 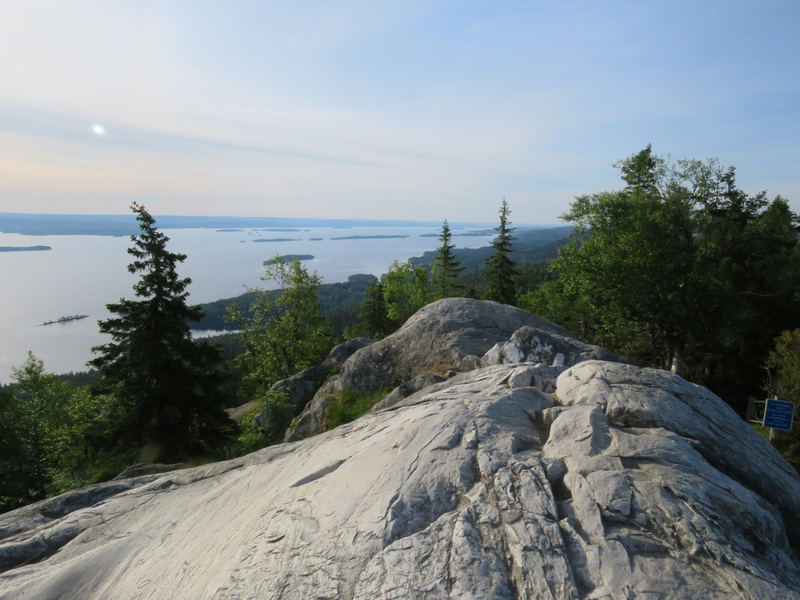 After packing up the tent and eating breakfast I went to Koli. 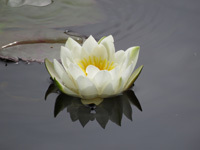 The sun was shining through thin clouds. 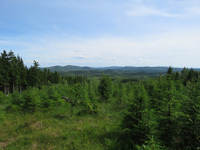 The weather was much better than it had been the previous year. 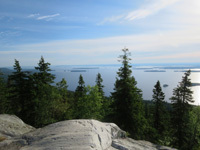 From Ukko-Koli peak I saw this view. 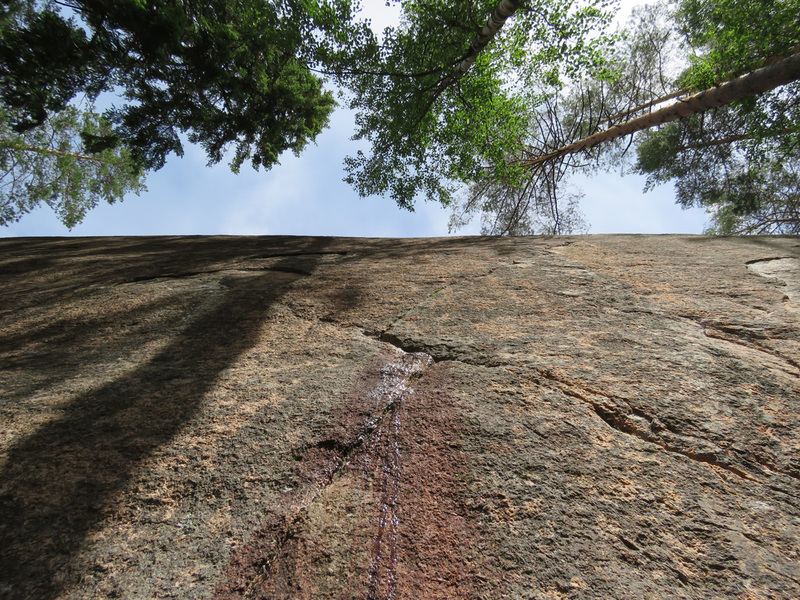 You can see the photosphere I took on the peak here. 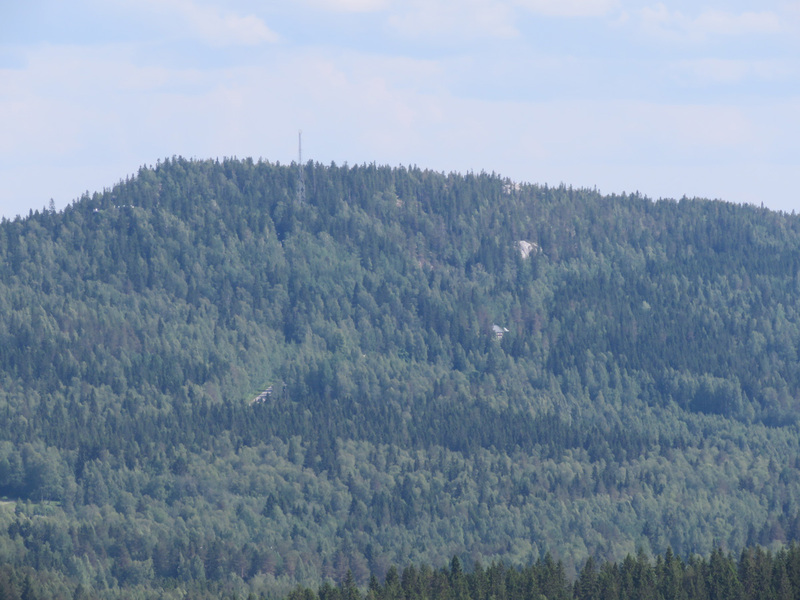 Ukko-Koli (‘old man Koli’) peak. The second photo shows my shadow while I’m sitting on the pillar that is on the peak. This year I had bought a camera with a big optical zoom. 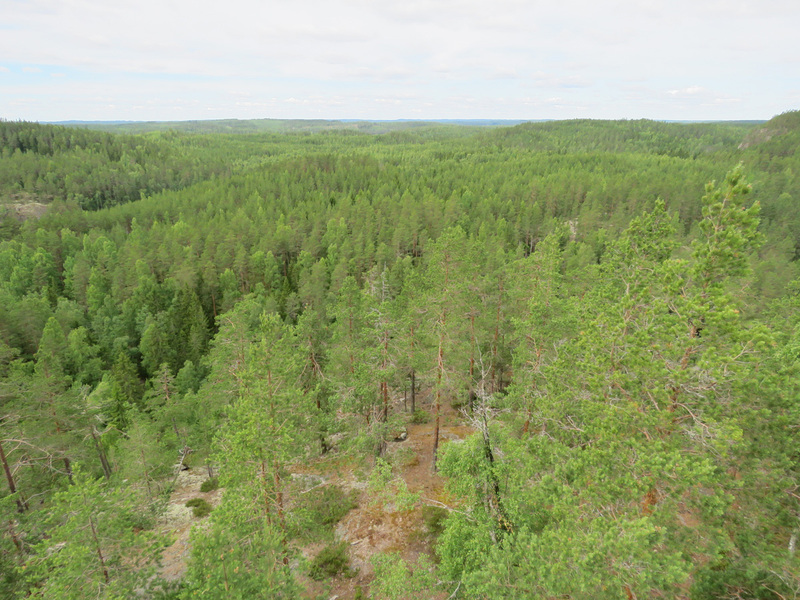 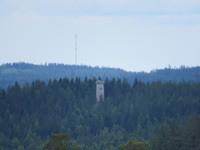 Here’s a view to Mäkrä hill a bit more than two kilometres away. 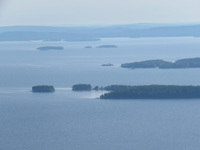 The other photo shows the islands of Lake Pielinen. 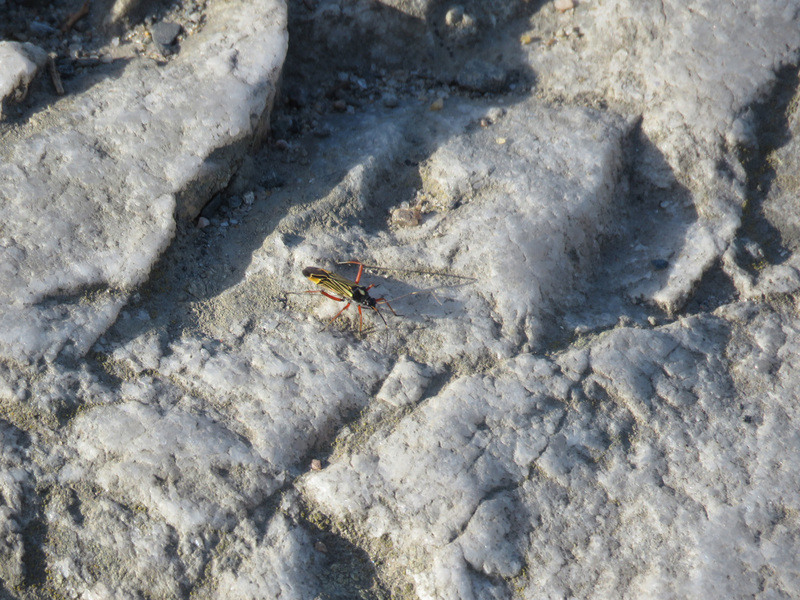 A bug was walking on the rock. 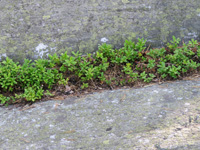 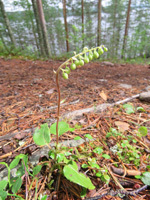 In a crack in the rock there grew common bearberry (Arctostaphylos uva-ursi). Some vandal had thrown cigarette butts on the rock. Akka-Koli (‘old woman Koli’) peak and view to the west. 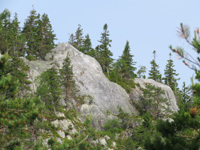 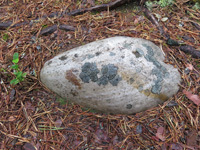 In the rock there grew a small spruce (Picea abies). 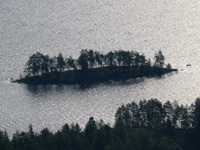 The islands called Matoset (‘little worms’). 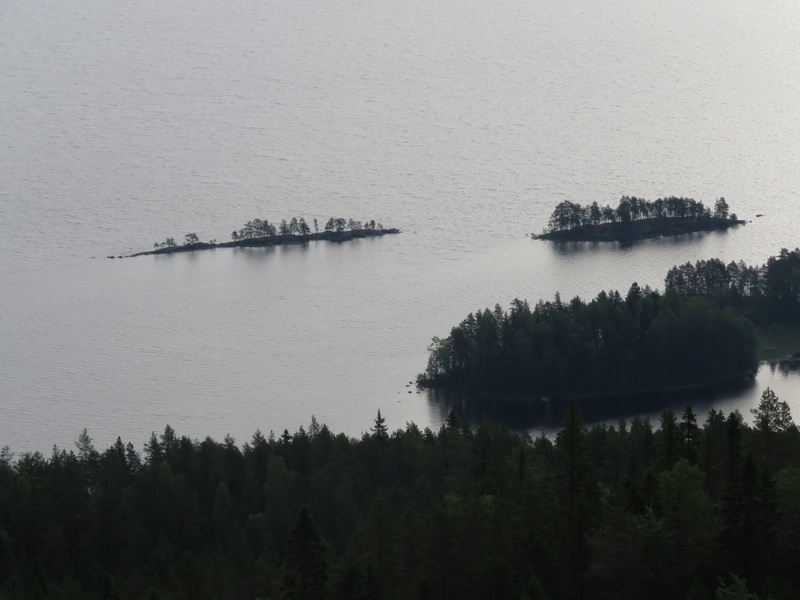 I like these islands, especially the narrower one. 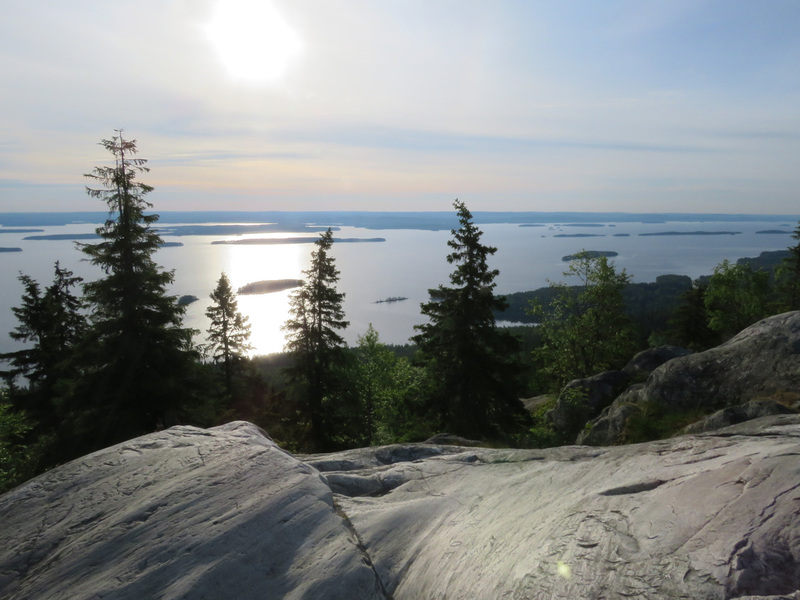 Paha-Koli (‘evil Koli’) peak was a good place to eat this time as well. 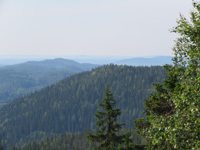 View from Pieni-Koli (‘little Koli’) to Paha-Koli. 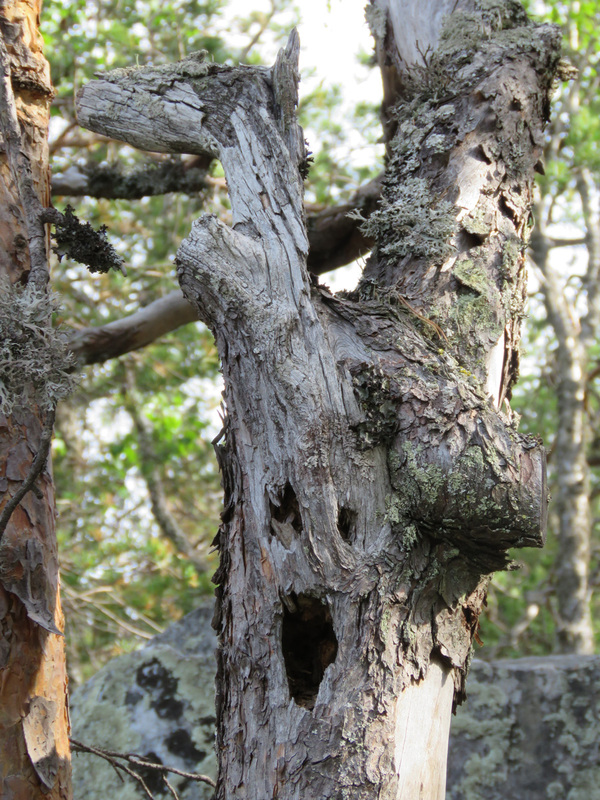 This tree looked like it was yelling. A spider was waiting for a better catch than that pine seed. 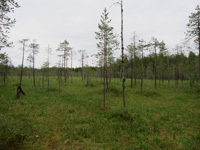 Mäkränaho meadow. 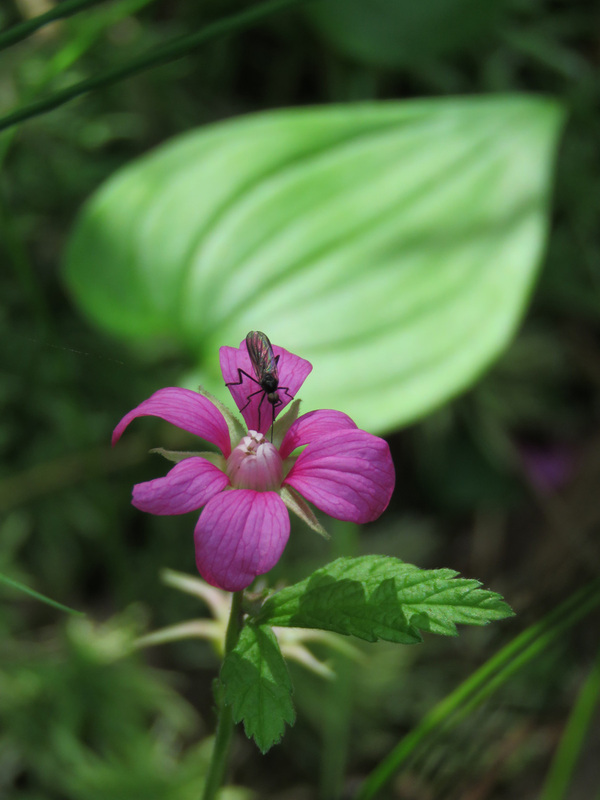 On the way there I saw an Arctic bramble flower with a fly. 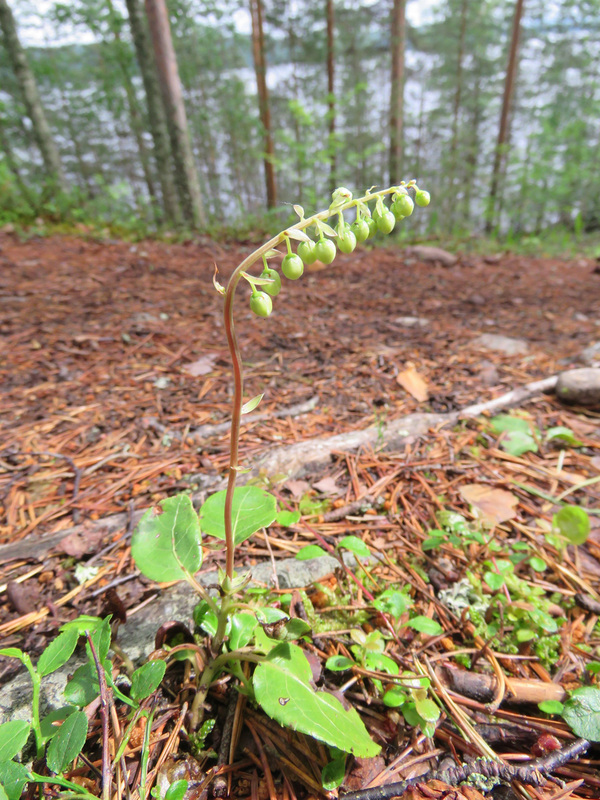 Behind it there is a leaf of a false lily of the valley (Maianthemum bifolium). 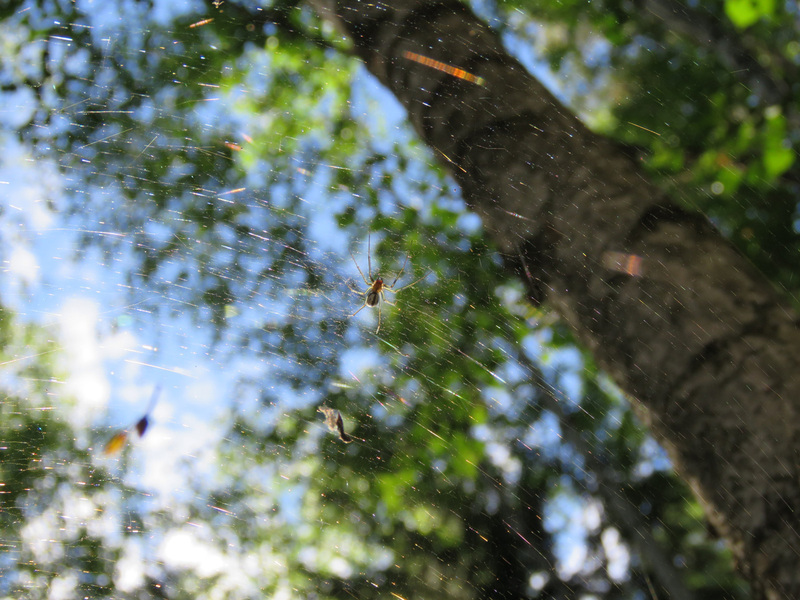 Tarhapuro waterfall and a spiderweb. 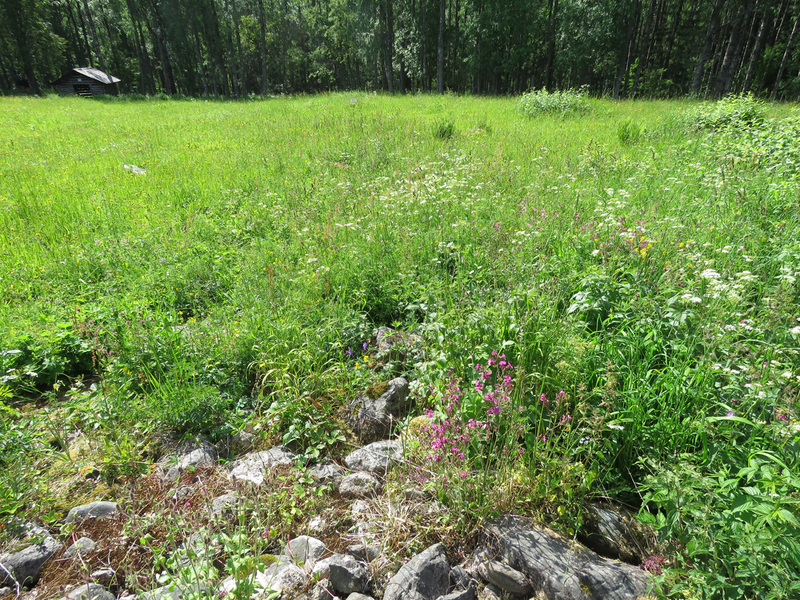 The path from Mäkränaho was a bit rough, but the path away towards Purolanaho meadow was easy to walk. On Purolanaho meadow there grew spotted orchids (Dactylorhiza maculata, possibly common spotted orchid, D. m. subsp. 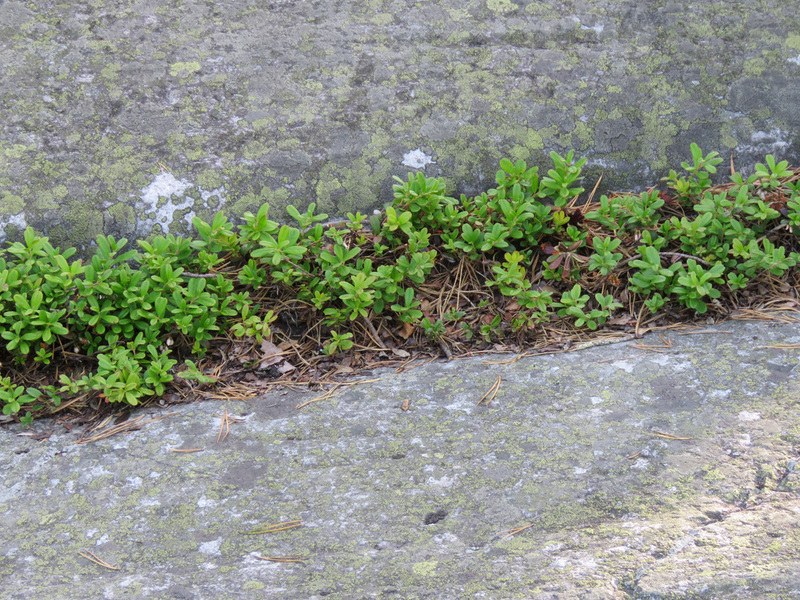 fuchsii). 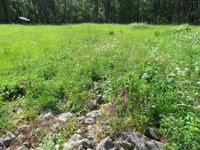 The other photo shows Ikolanaho meadow. 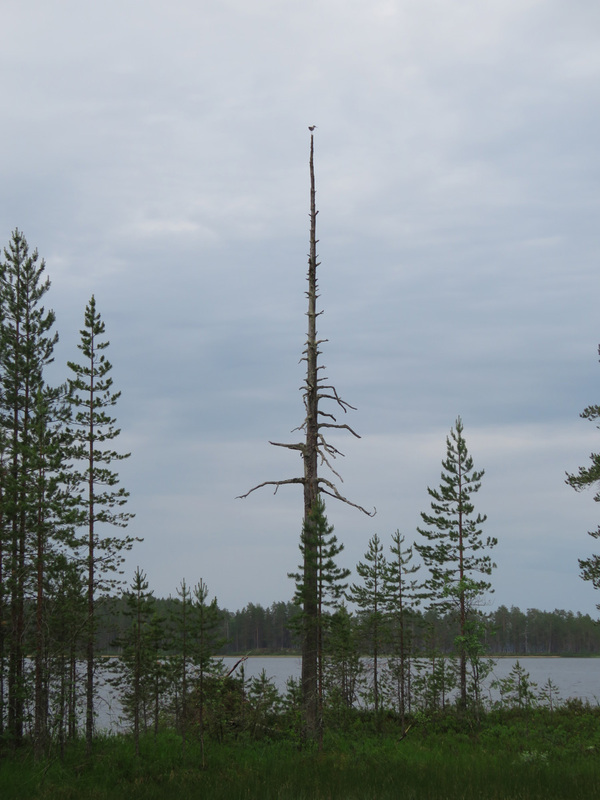 A little after noon I came to a campfire site near Mäkränaho, but the forest fire warning had just begun. 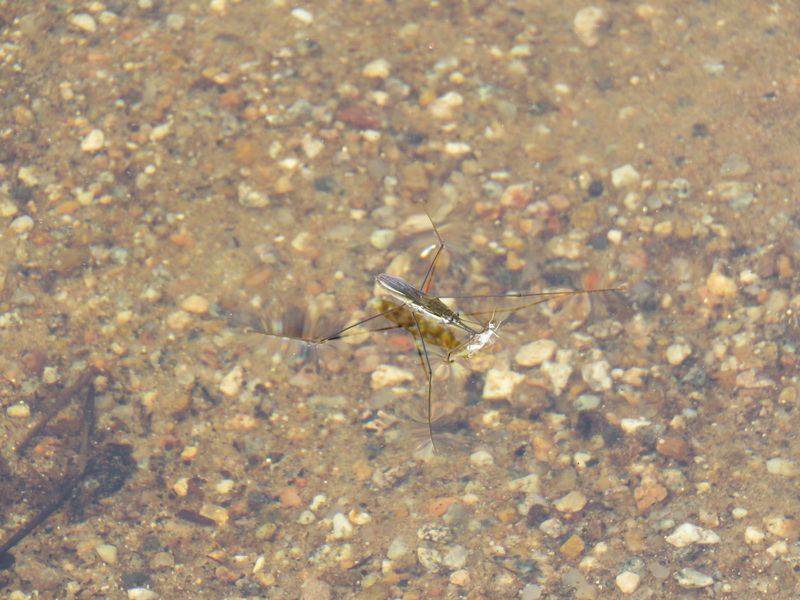 Luckily I had food that could be done in cold water as well, but it wasn’t as good that way. 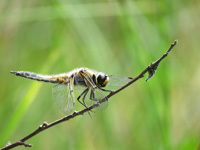 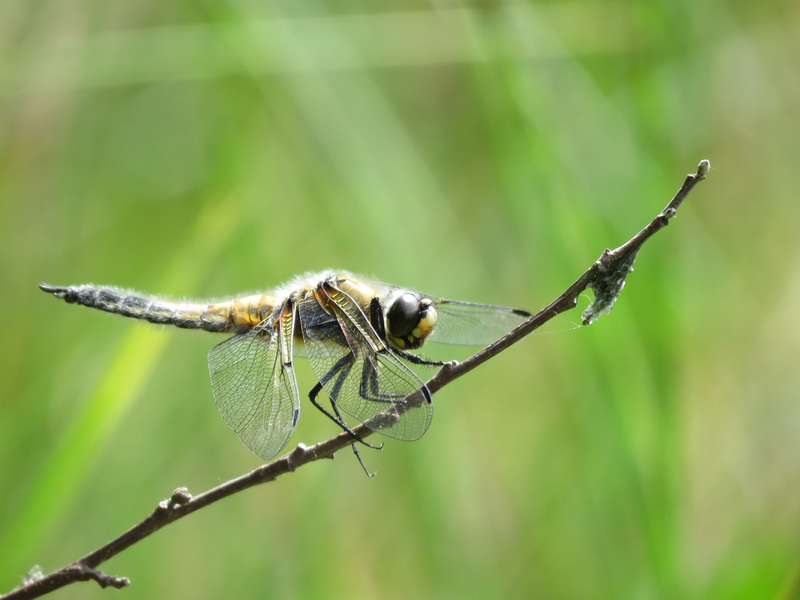 On the way to the car I saw a four-spotted chaser (Libellula quadrimaculata). From Koli I went to Räsävaara hill, this time the view was good from there as well. 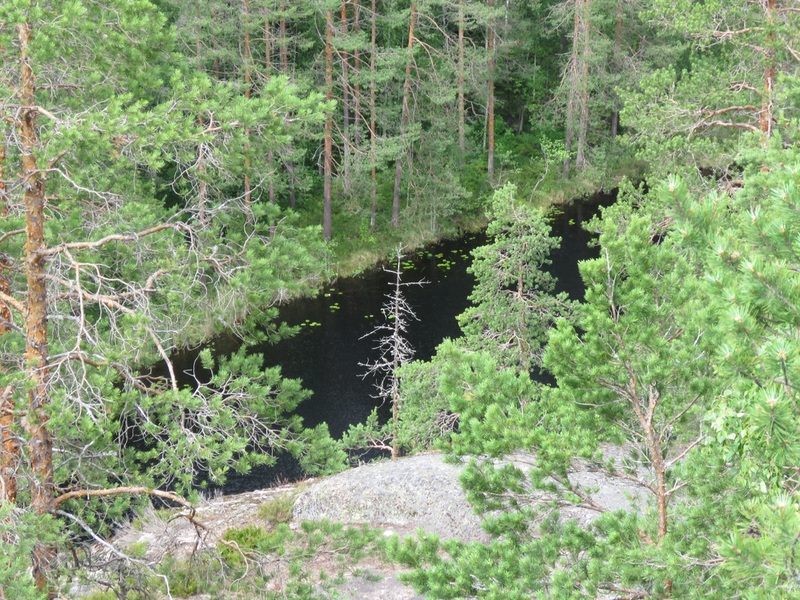 Here’s the pond that the artist Eero Järnefelt painted in 1895. 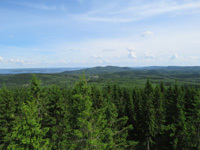 View from Räsävaara towards Koli. 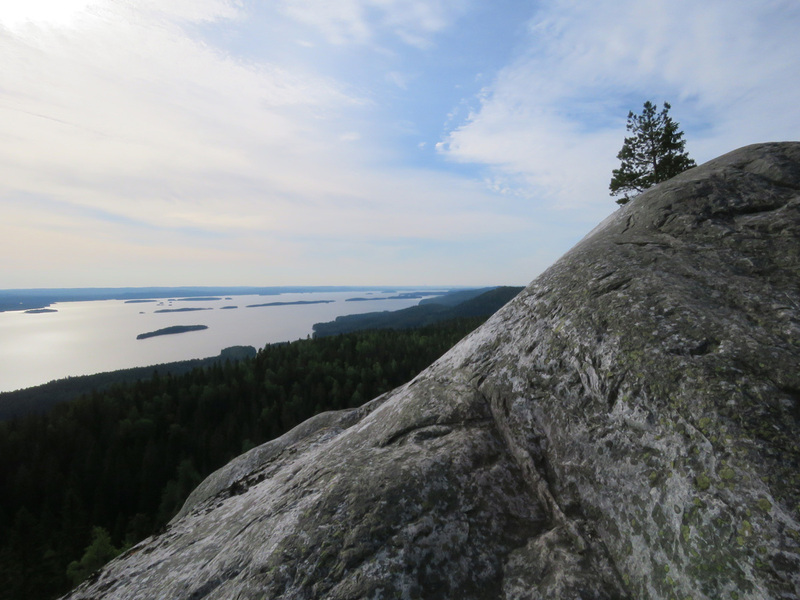 The peak of Koli. 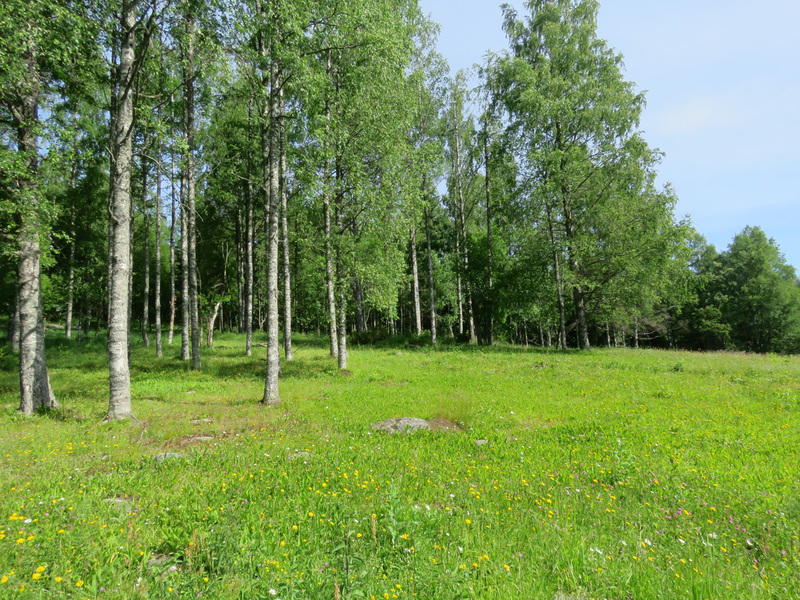 The pastures of Ollila and Turula and the camp site where I slept. 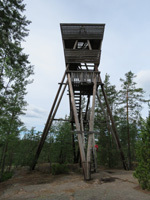 Räsävaara scenic tower and views from the top. 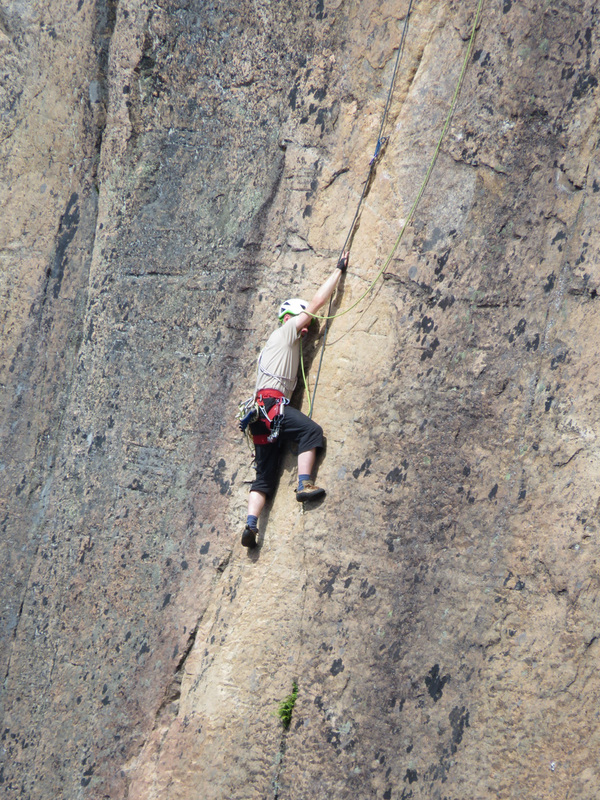 I’m acrophobic, although not nearly as much as when I was younger, so it took some time to get used to the height. 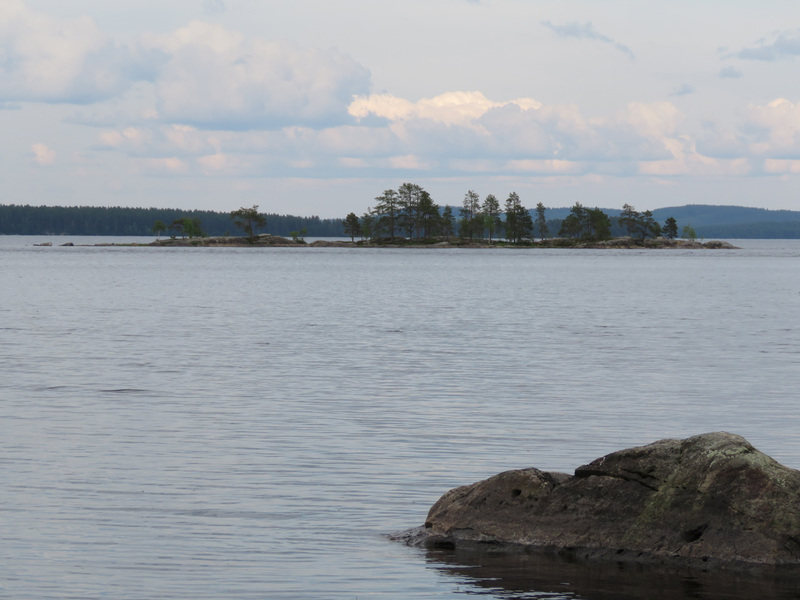 Just for fun, I drove to Hattusaari island before leaving. 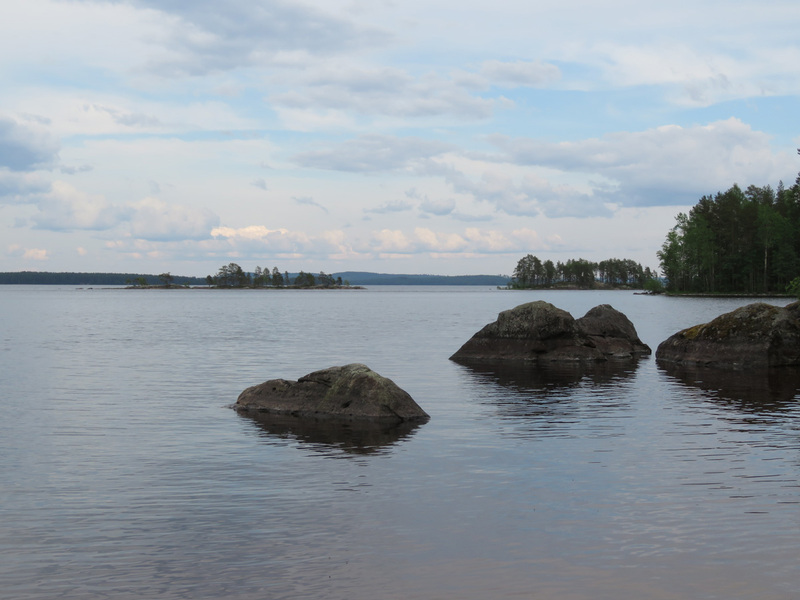 I went for a swim in Lake Pielinen. 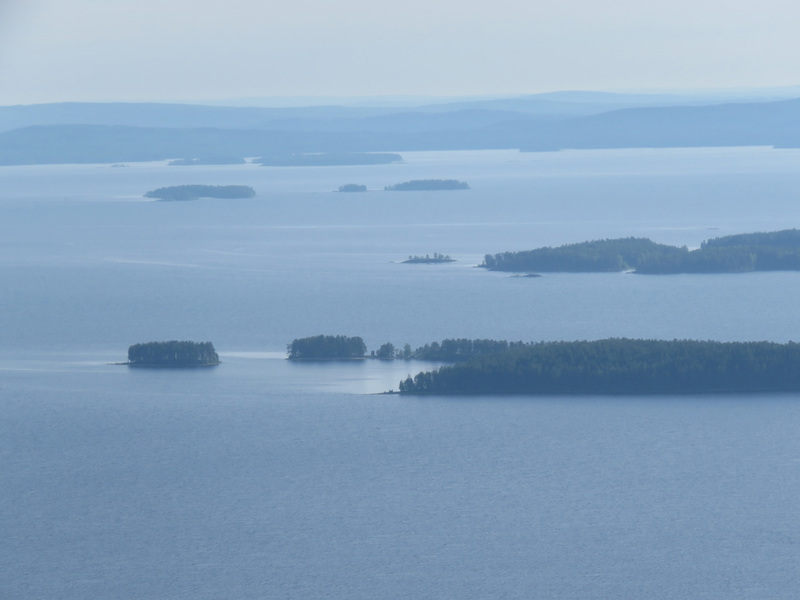 I stopped to take photos of the Matoset islands. 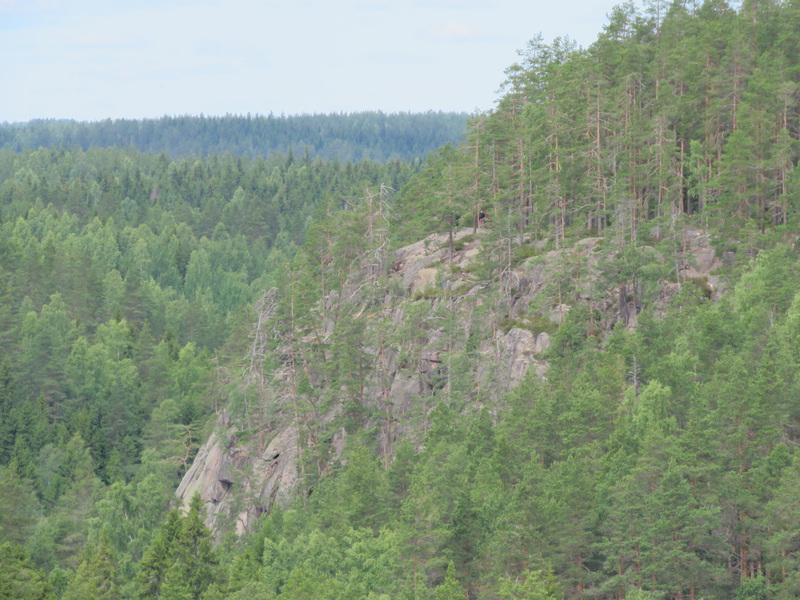 I went to the Pirunkirkko cave this time as well. 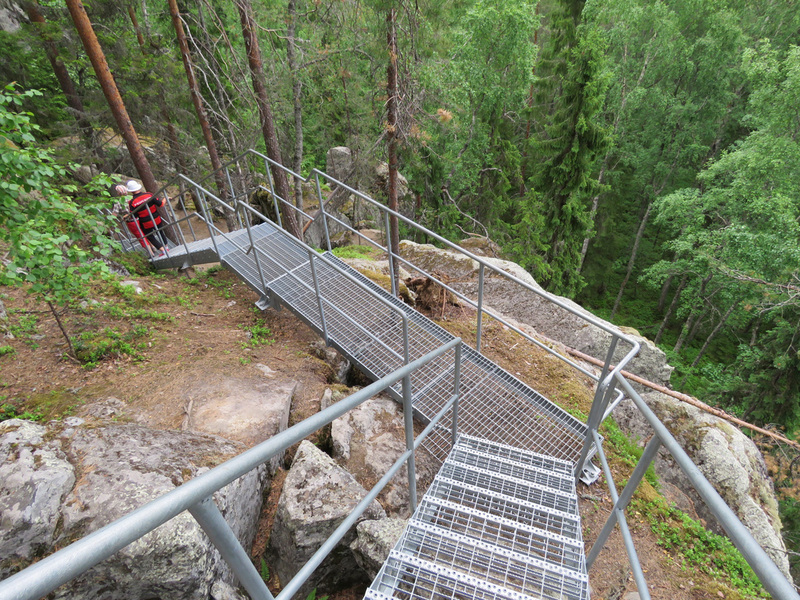 I’ll just show this photo that shows that the wooden stairs were replaced with metal ones. 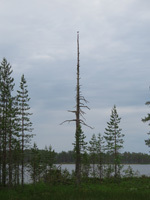 I arrived at Patvinsuo National Park at Suomu camp site after eight in the evening and put up my tent. 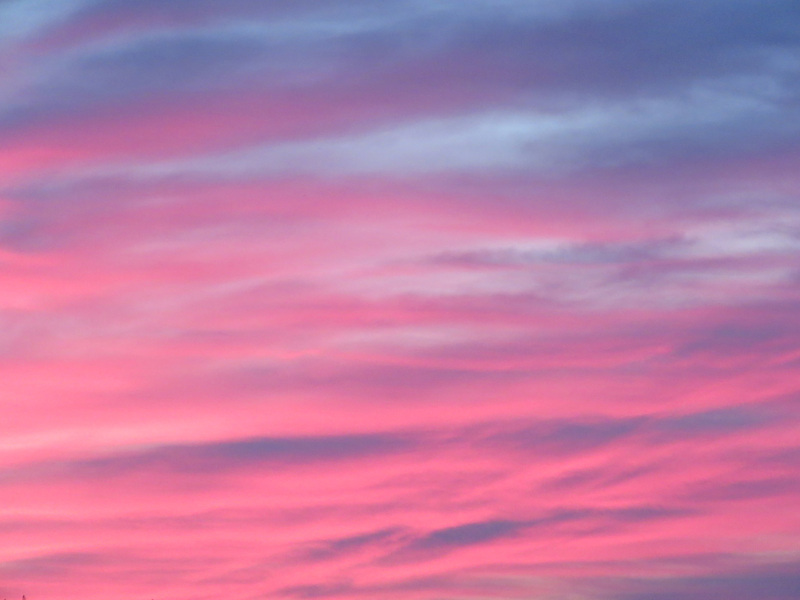 I woke up at seven. It was already raining a bit, there were a lot of mosquitoes, and at first I went to the wrong path, which made me a little irritated, but the feeling went away soon. 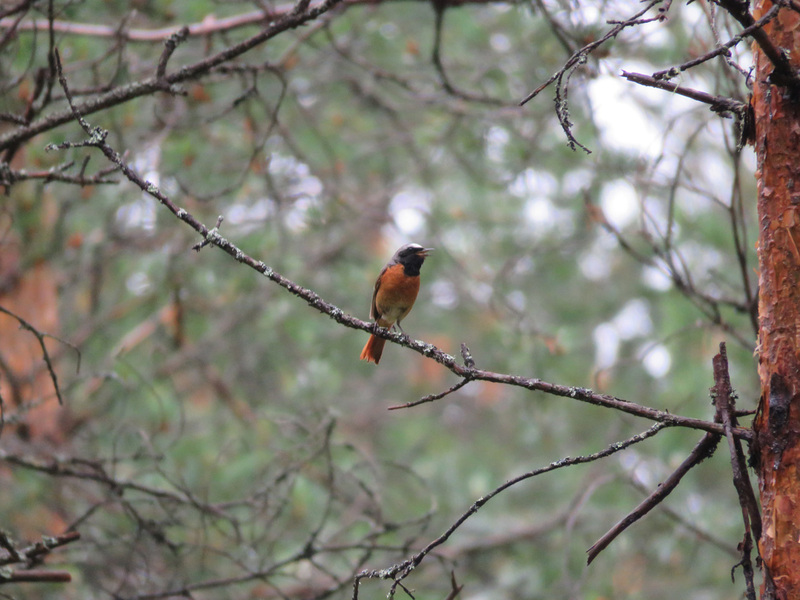 During the day I had to take off and put on the rain gear several times as the weather kept changing. The mosquitoes didn’t bother me that much because I was wearing a mosquito hat. 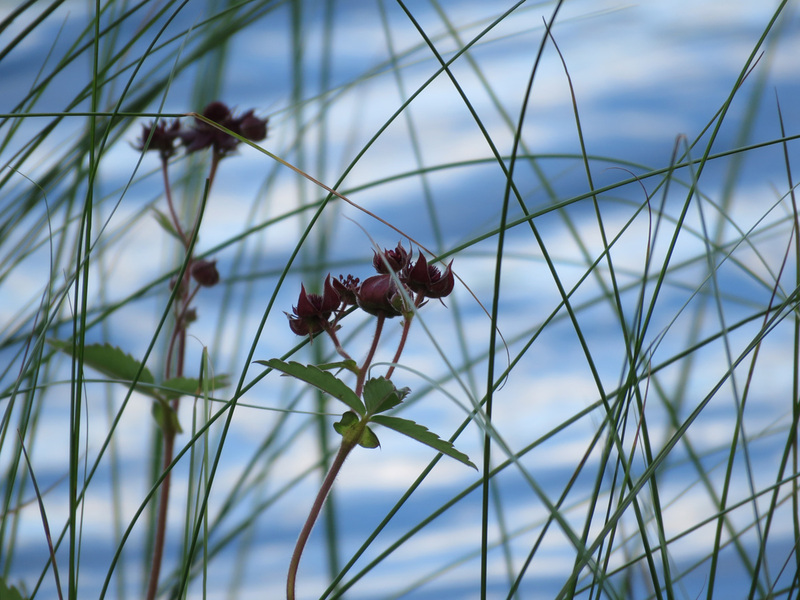 Sometimes even the wind kept them away and I didn’t have to wear the hat all the time. I went around Lake Suomunjärvi clockwise. 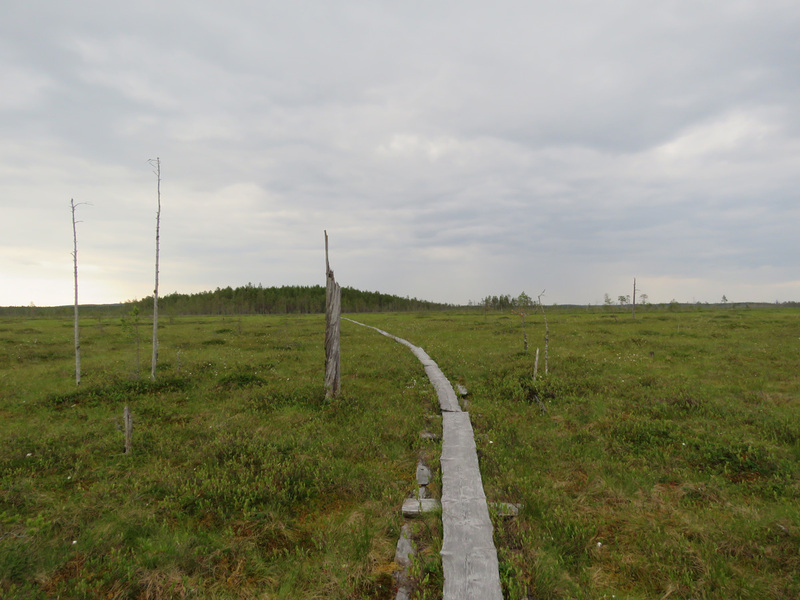 The path is 15km long, but in the end I also went to another path to see some bogland. 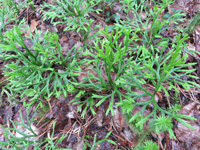 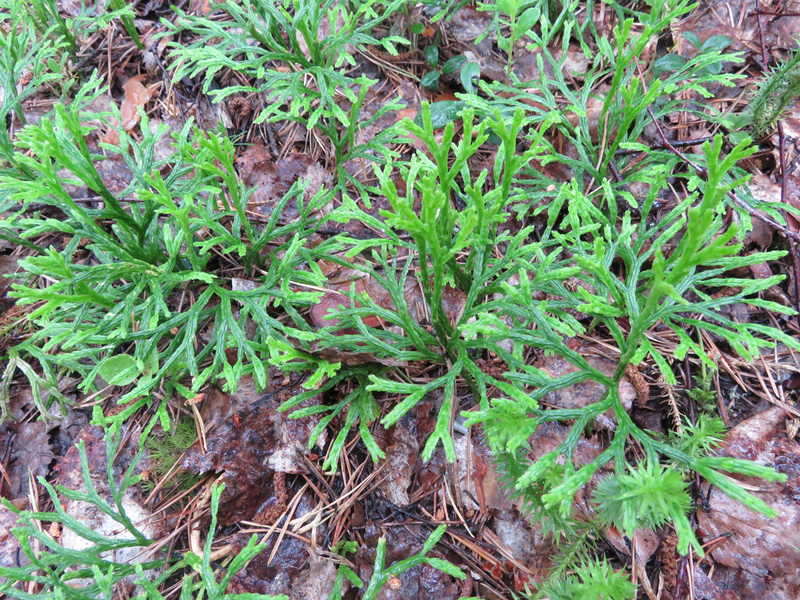 I saw some groundcedar (Diphasiastrum complanatum) along the path. 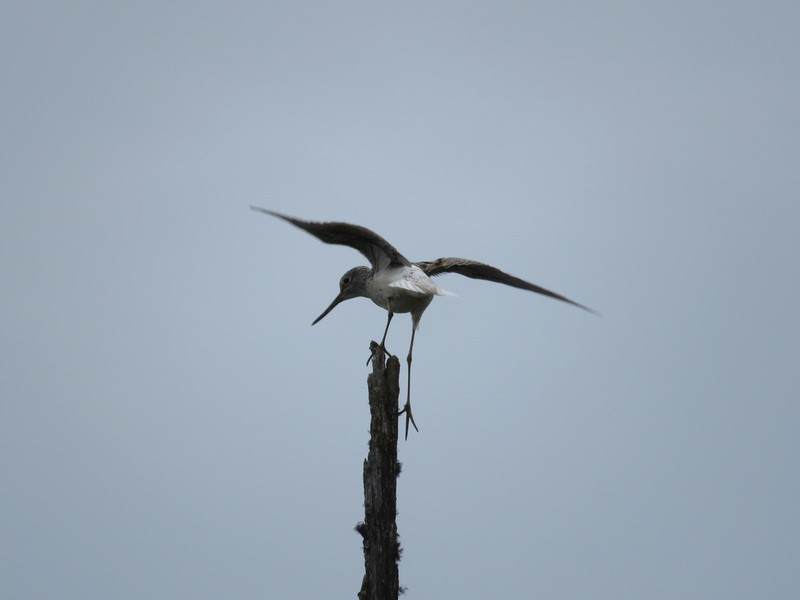 A common greenshank (Tringa nebularia) was balancing at the top of a dead tree and shouting loudly that I was on its territory. 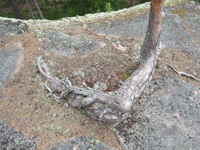 A tree had bent while growing. 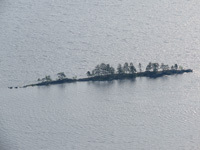 The tombolo between Lapinniemi cape and Lapinsaari island. 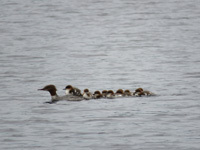 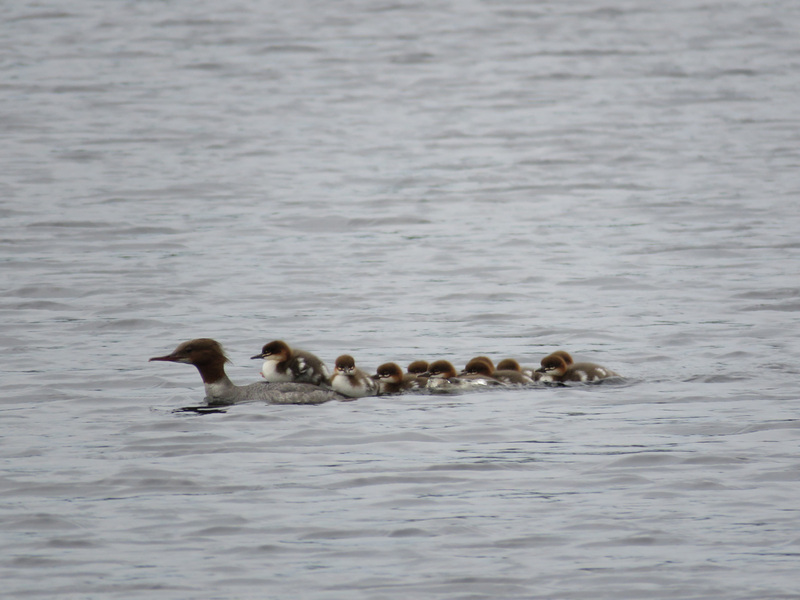 Next to it, a goosander (Mergus merganser) was swimming with its brood. 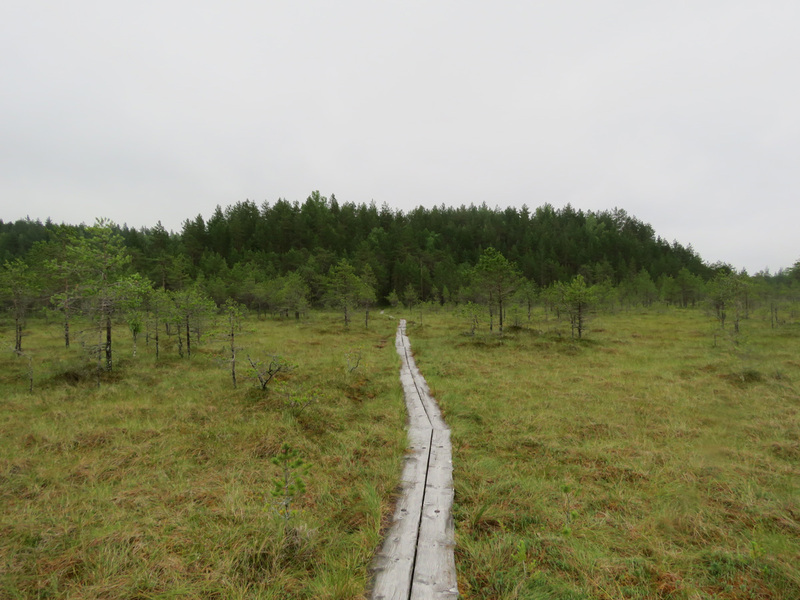 The path went mostly through pine forest, but there was some bog as well. 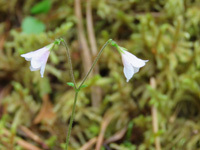 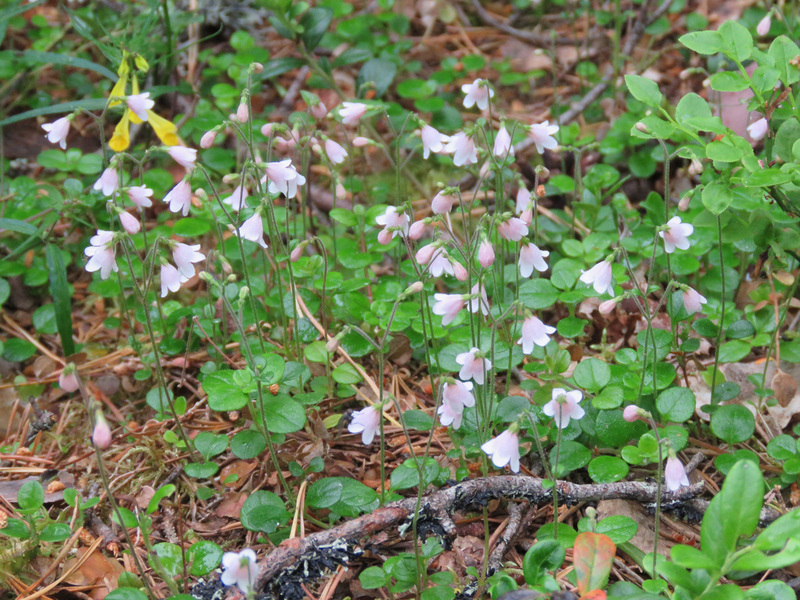 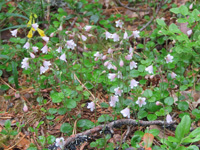 Twinflowers (Linnaea borealis) were blooming. 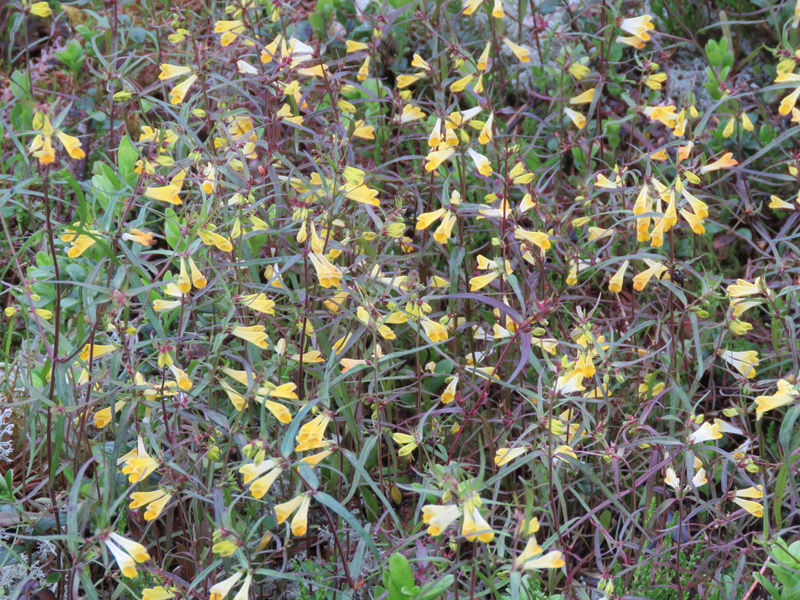 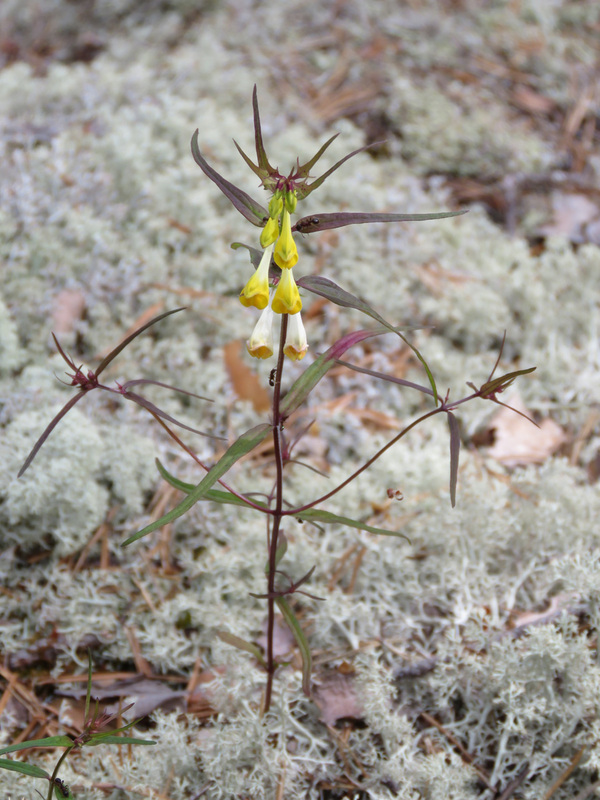 Common cow-wheat (Melampyrum pratense) and a beautiful rock. 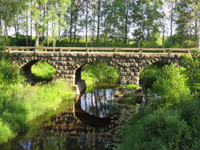 There’s a bridge across the river that flows from Lake Karkunlampi to Lake Suomunjärvi. 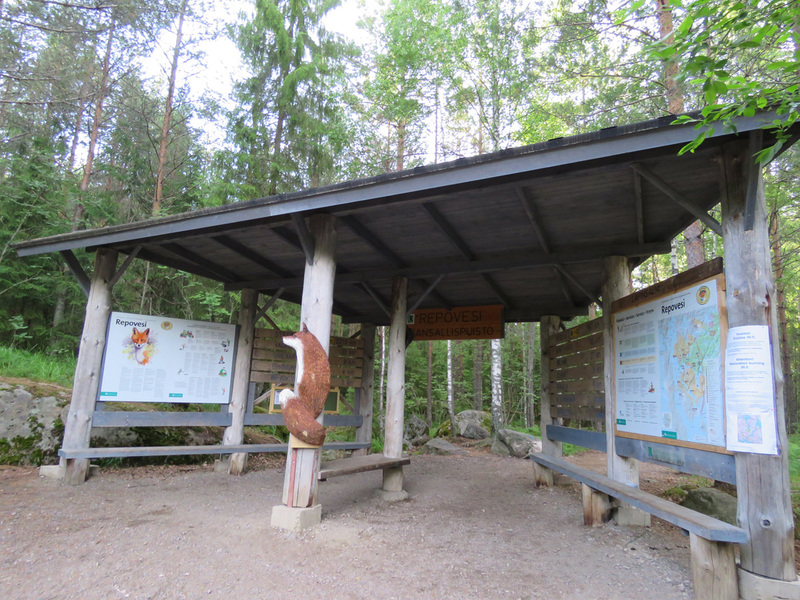 I stopped to eat something at Pokkaniemi camp site. 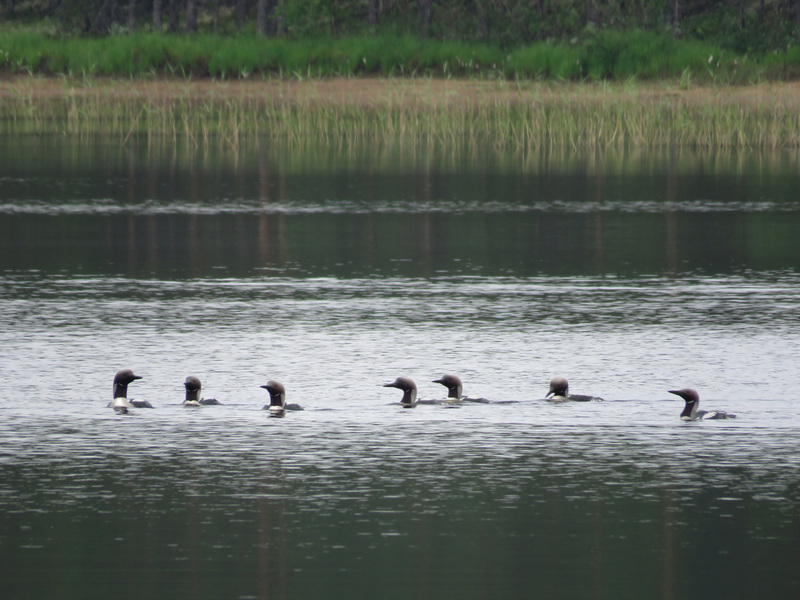 A couple of duck broods got startled by my coming and ran to the water. 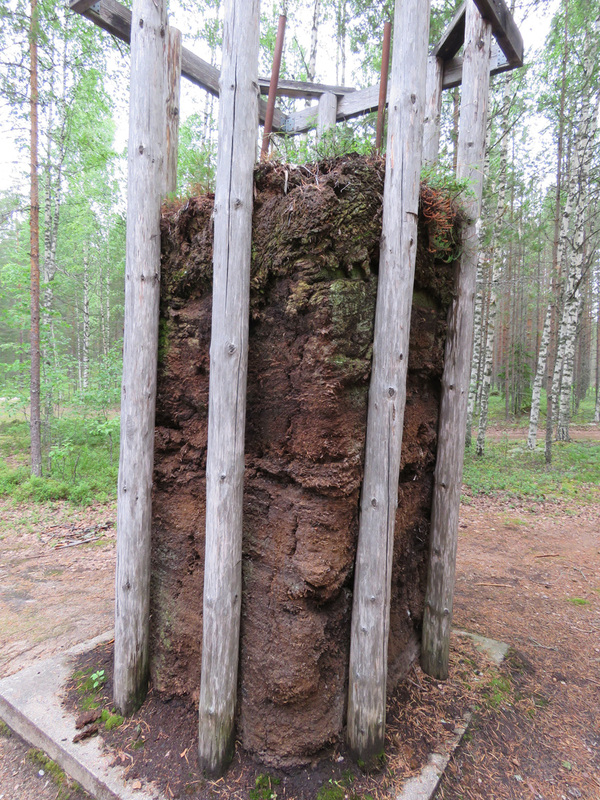 I sat eating in the woodshed to shelter from the rain. 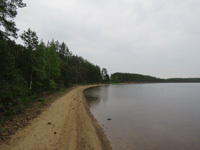 The lake has several beautiful sandy beaches. 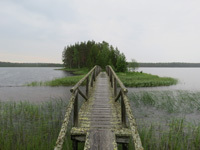 The bridge across Virtasalmi strait between the lakes Alanne and Suomunjärvi is covered in lichen but in good condition. 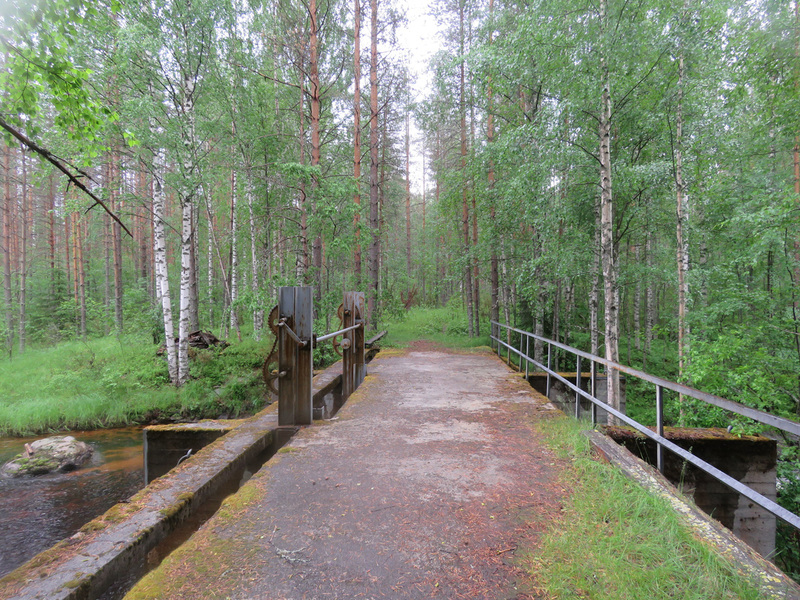 The forest in Virtaniemi and a dam on the border of the national park. 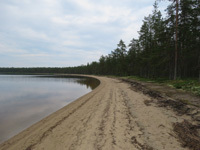 Beach next to Huutoniemi cape. 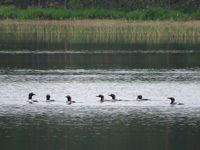 A flock of black-throated loons (Gavia arctica), a part of which is shown in the photo, was swimming on the lake. 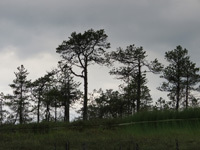 At this time the sun was peeking through the clouds a bit. I found a fifty cent coin on the beach. 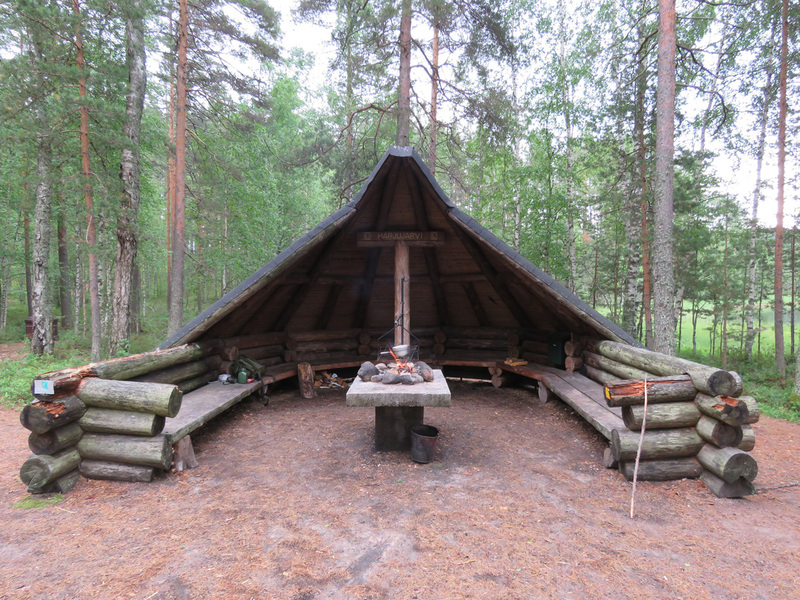 I arrived at Kurkilahti cooking shelter at two in the afternoon. 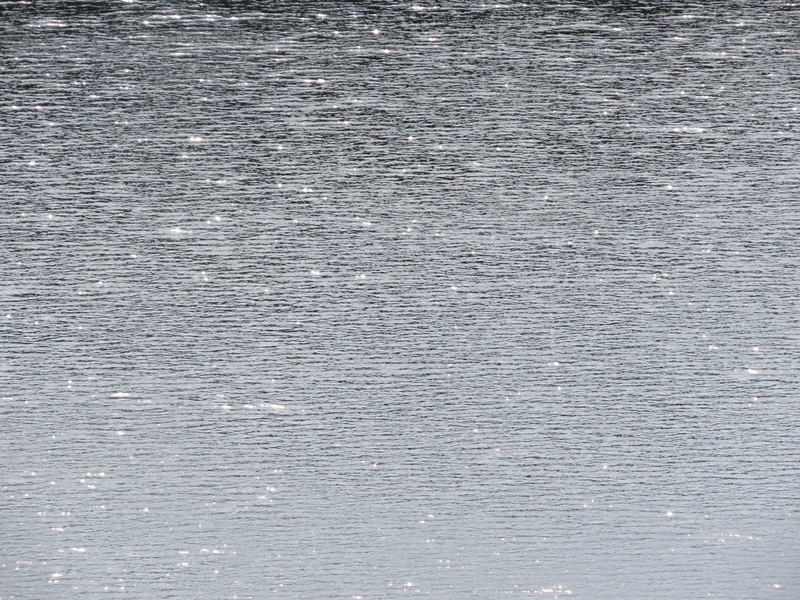 The sun was peeking a bit more. 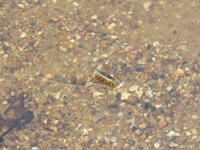 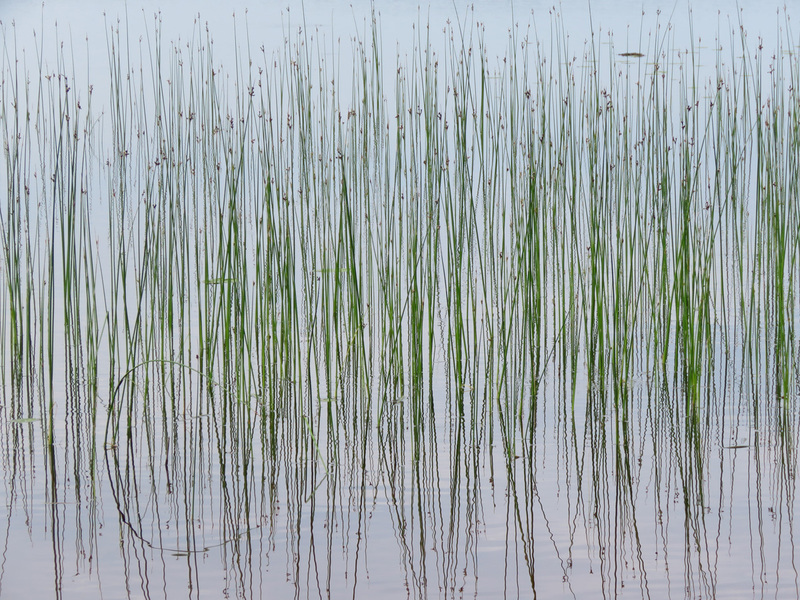 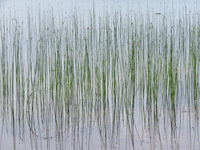 In the photos there is lakeshore bulrush (Schoenoplectus lacustris) and a water strider (Gerridae family). 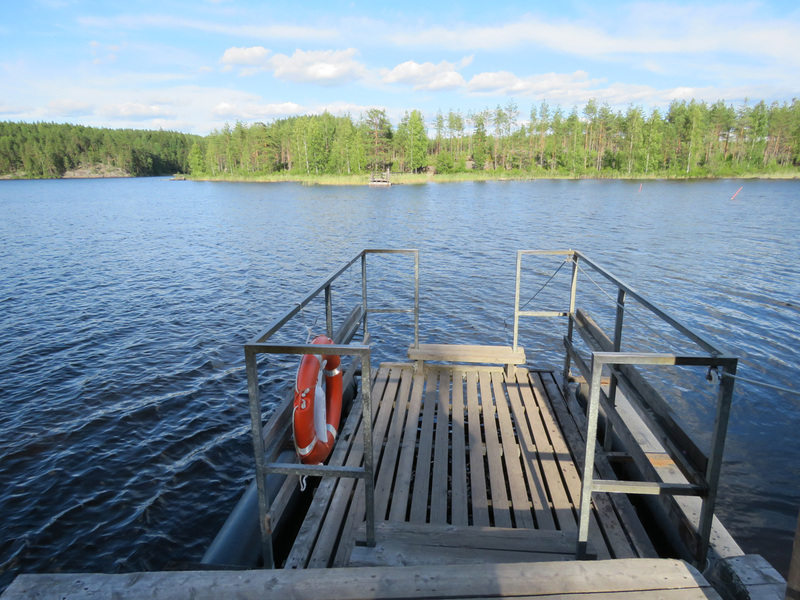 I went for a swim and ate lunch at Kurkilahti. 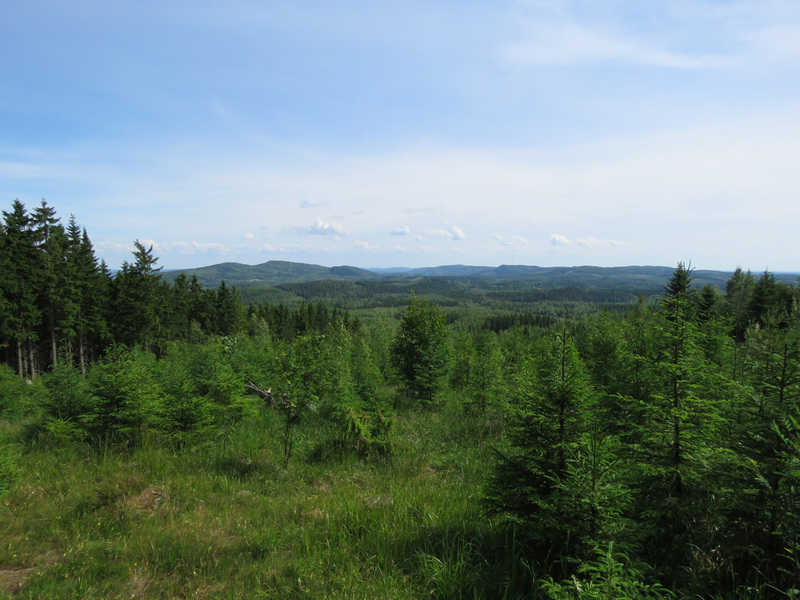 Mosquitoes and horseflies buzzed around me, but the weather was nice. The path would have continued along the southern shore of the lake back to the camp site, but because there had been only a little bog along the path, and bog was the reason I had come here, I decided to go to another path. 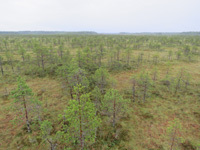 The landscape changed immediately into an open bog. 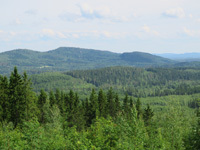 I like landscape like this. 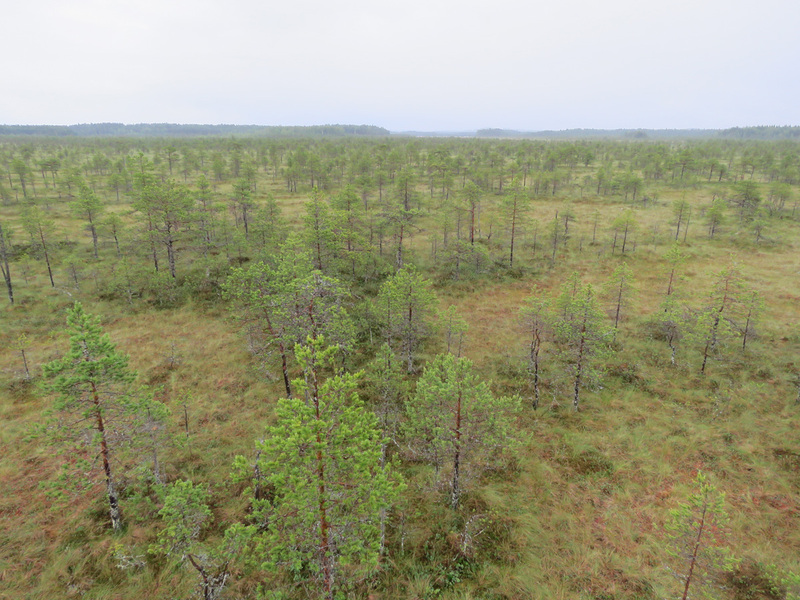 The rain started again when I got to the bog and continued for the rest of the day, but being on the bog was worth it. 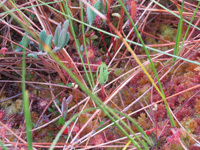 Colours of the bog. 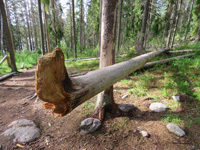 The dead tree was like a street sign, although it pointed away from the path. 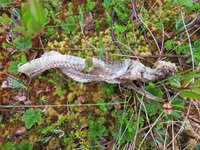 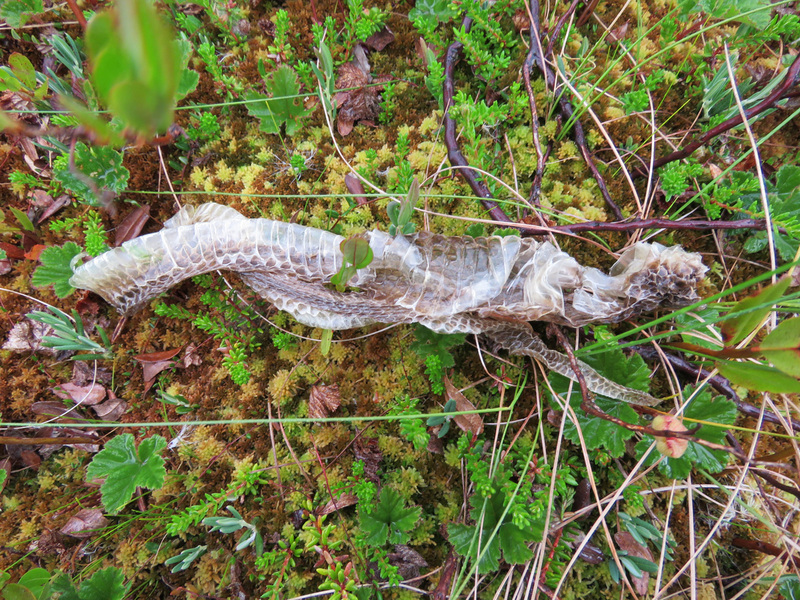 A snake had moulted its skin. 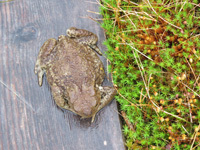 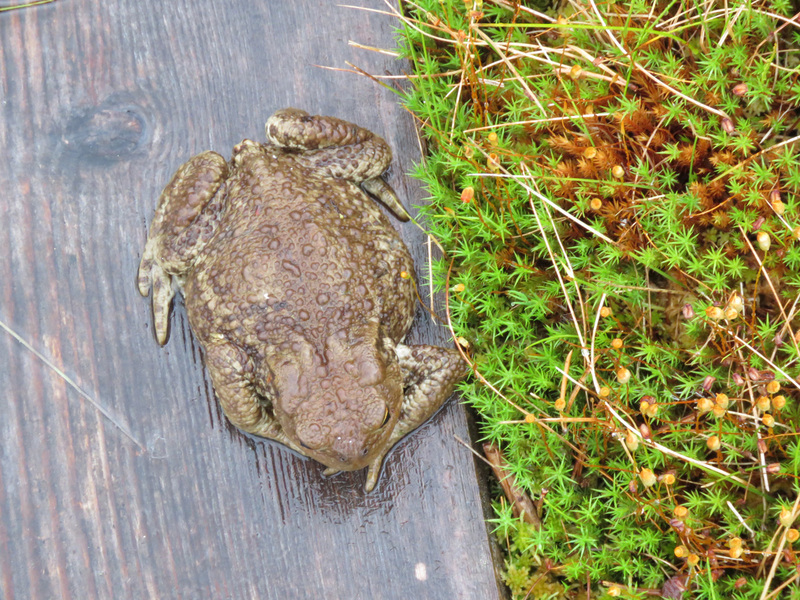 A common toad (Bufo bufo) was resting on the wooden path. 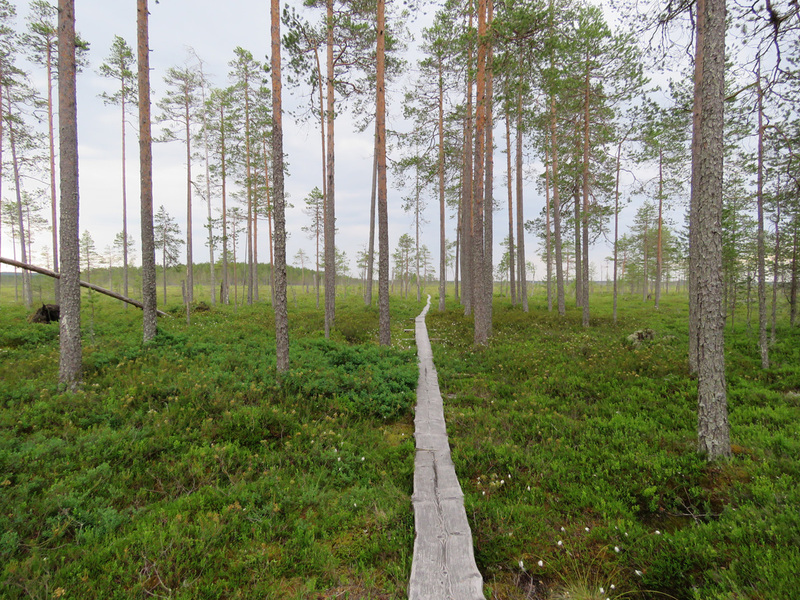 The path on the bog was longer than I had thought. 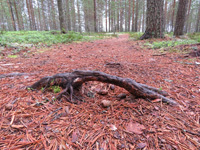 The wooden path was slippery from the rain, and sometimes the side wind was so strong that it was difficult to stay up. 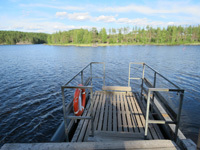 My shoes are a bit water resistant, but by six in the evening when I arrived at the car, my feet were swimming in water. 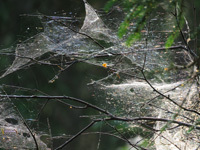 I changed into dry clothes and shoes, and got ready to leave. 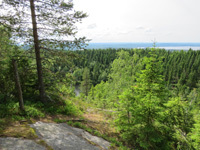 I had planned to take small roads to Lieksa and go to Leivonmäki via Nurmes and Kuopio, but I dropped that plan and chose a straight route to Leivonmäki. I stopped again in Joensuu to buy more food, and in Hankasalmi to fill the tank. 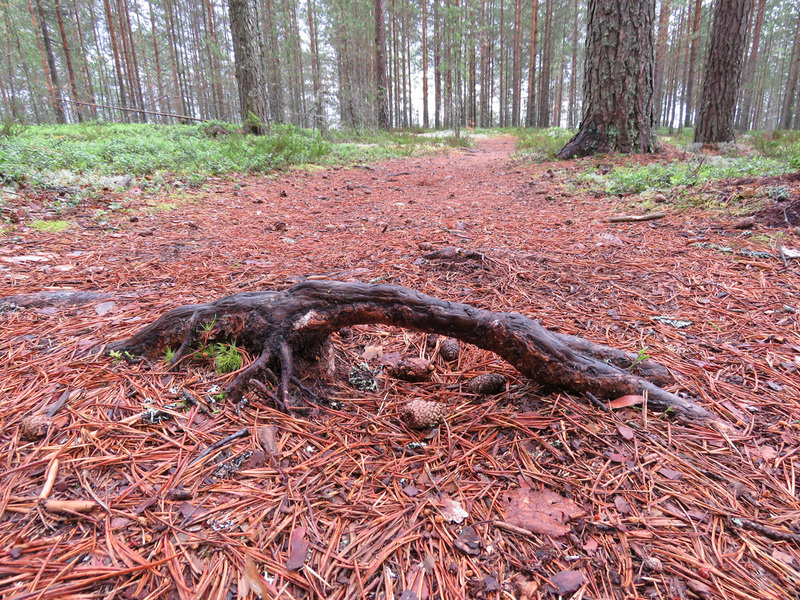 It rained on the way, sometimes quite hard, and the road had deep ruts. 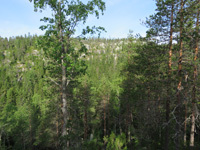 At around ten in the evening the rain stopped. I stopped at the crossing of Highway 4 and the road leading to Rutalahti village to take photos of the evening sky. 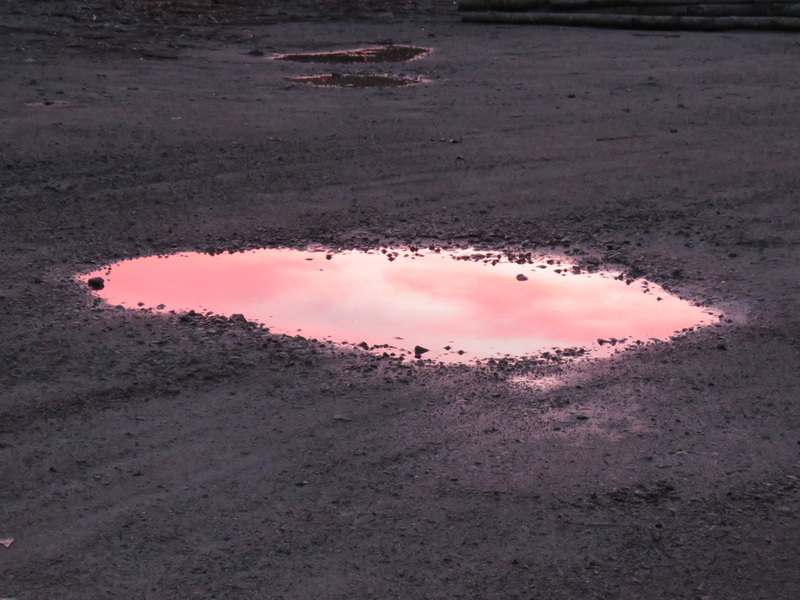 The sky reflected nicely in puddles. 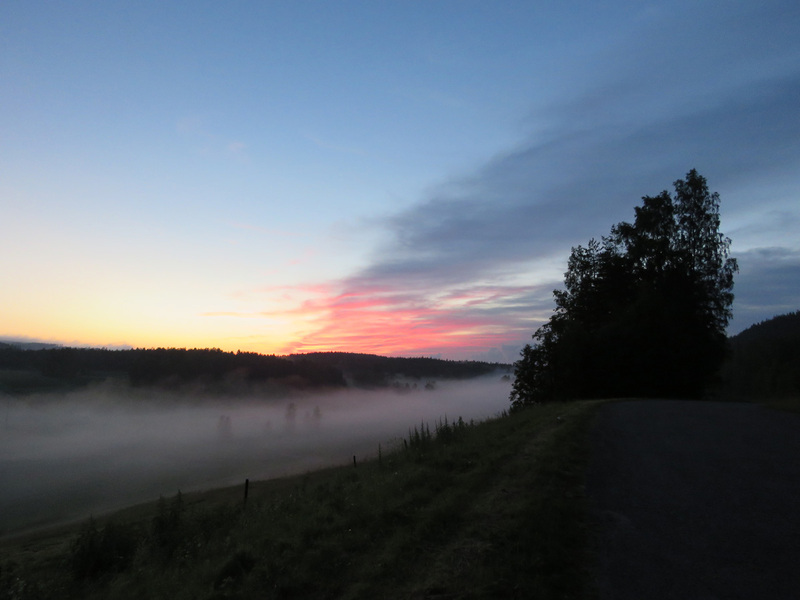 I also stopped at a place called Bavaria valley to take more photos of the sky and the foggy landscape. 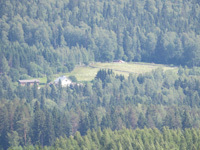 I arrived at Rutalahti at midnight and left the car in front of the former school building. 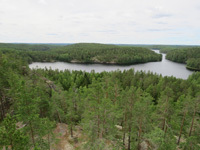 I had lived in Rutalahti for four years as a child. 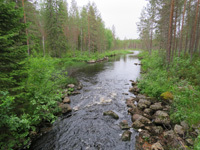 I wanted to go see the big spruce tree on the school yard and the rapids of the nearby Rutajoki River. 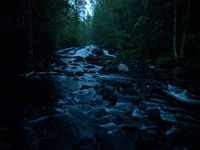 I walked to the river through the dark forest. 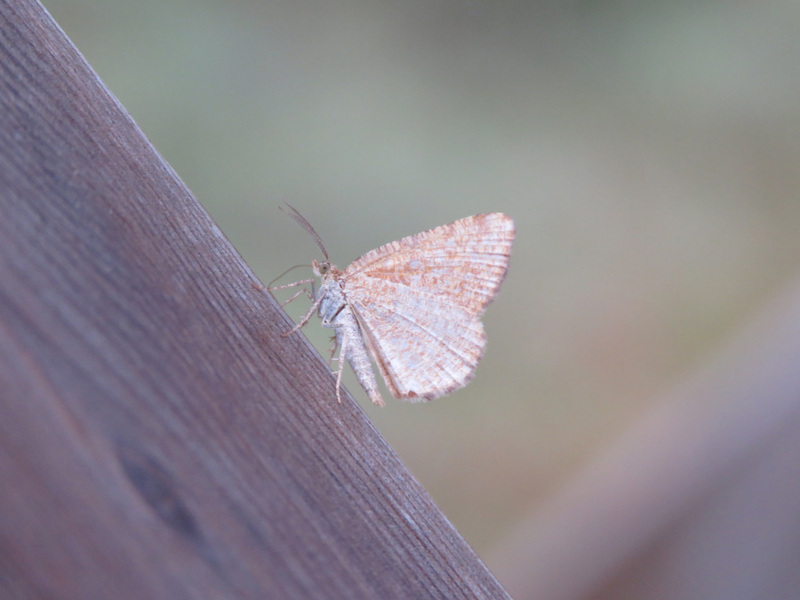 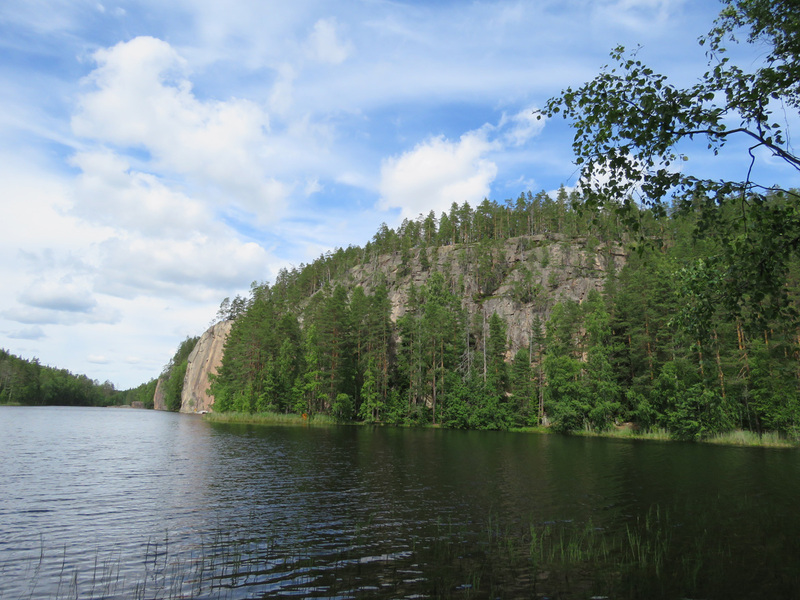 I continued to Leivonmäki National Park, where I arrived at half past twelve. 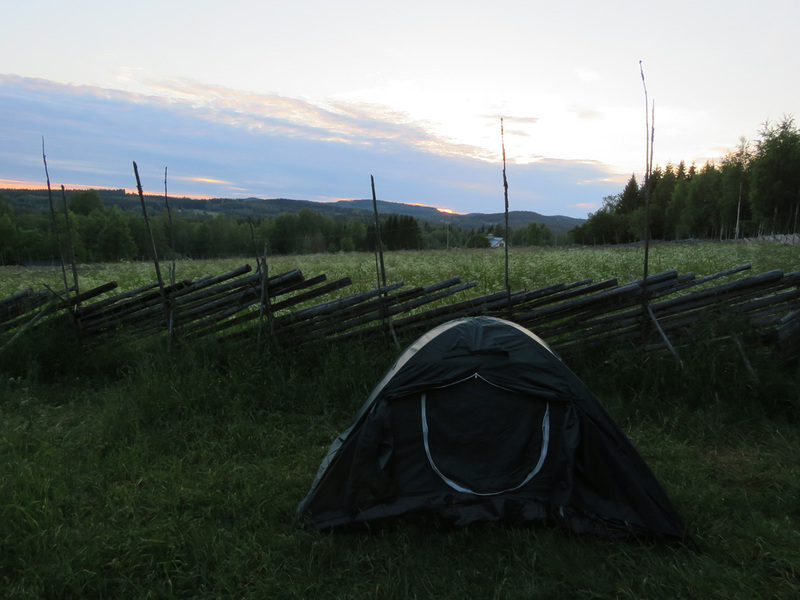 I put up my tent and started to sleep. I woke up at eight, but started walking only at half past nine. 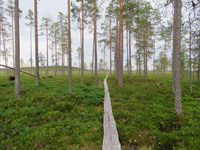 I took a path that goes through both esker forest and bog. 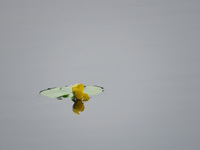 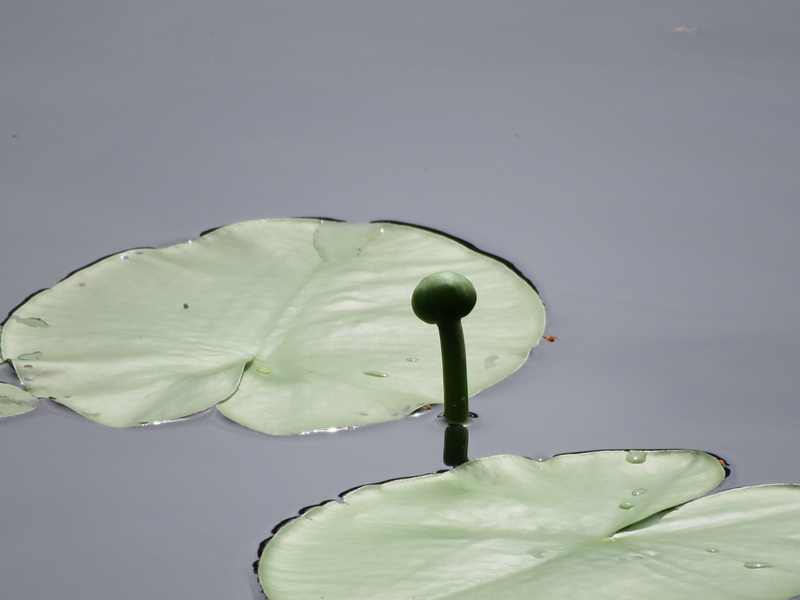 Yellow waterlily (Nuphar lutea) and common wintergreen (Pyrola minor). 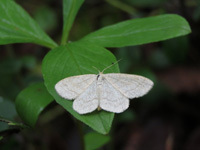 Common redstart (Phoenicurus phoenicurus) and a female geometrid moth (probably of subfamily Sterrhinae or Ennominae) on the leaf of chickweed wintergreen (Trientalis europaea). 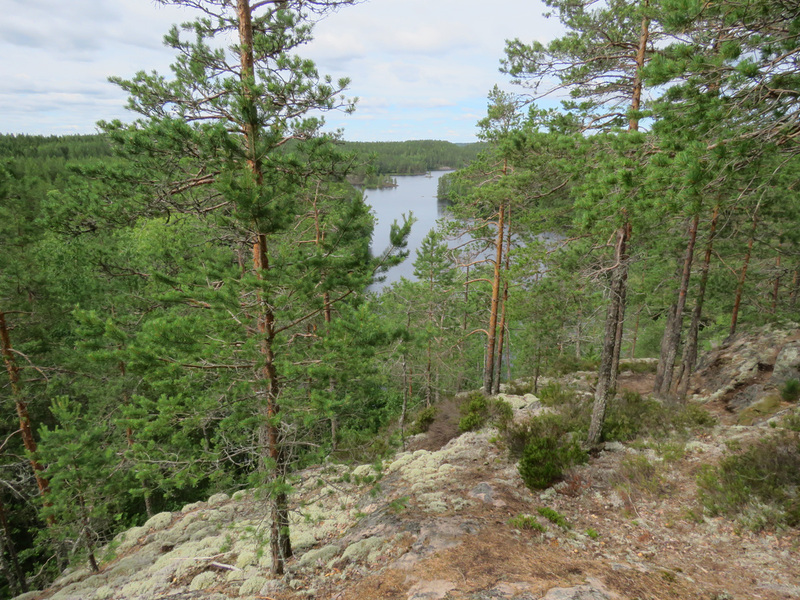 From the path separates another one that goes to the tip of Joutsniemi cape that protrudes into Lake Rutajärvi. 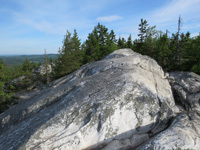 The cape is a long and narrow esker. I arrived at the tip at noon. 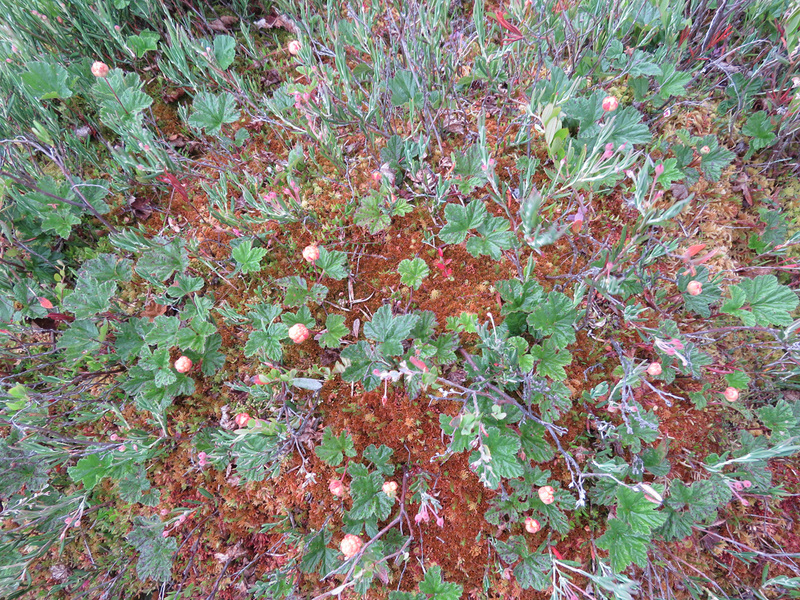 Along the path there grew a one-sided wintergreen (Orthilia secunda) and in the tip of the cape a marsh cinquefoil (Comarum palustre). 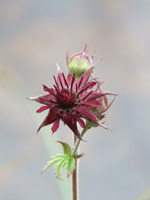 Marsh cinquefoil is one of my favourite plants. 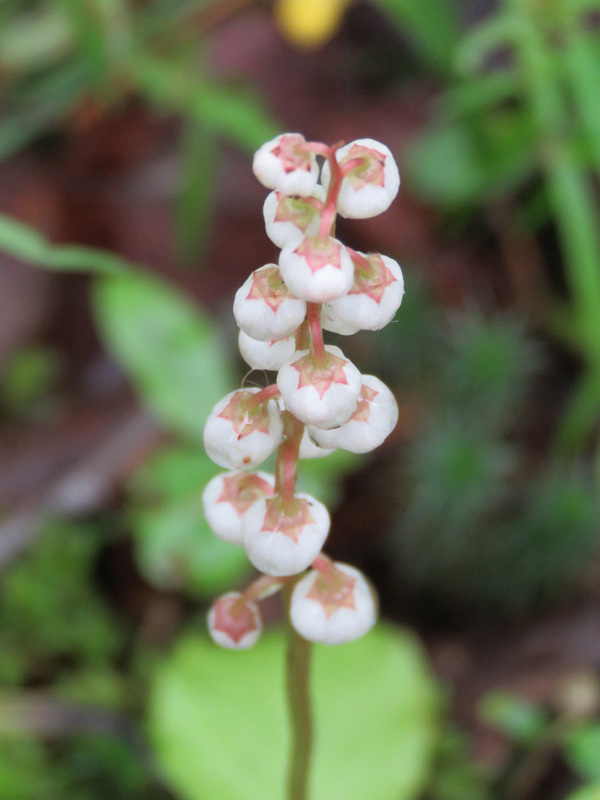 The bigger red parts are sepals and the smaller ones are petals. 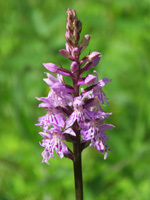 In the centre, the bigger spikes are stamens and the smaller ones are pistils. 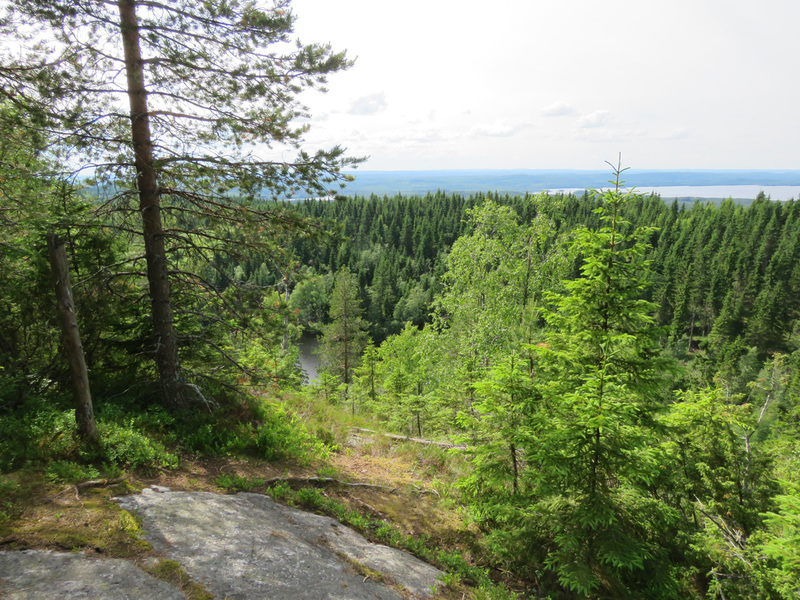 On the way back, I took a break at Lintuniemi campfire site. 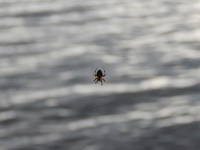 At the shore there was the web of a European garden spider (Araneus diadematus), and I nearly bumped into it, because it was hard to see against the water. When I arrived at the car, I noticed I hadn’t locked the doors. 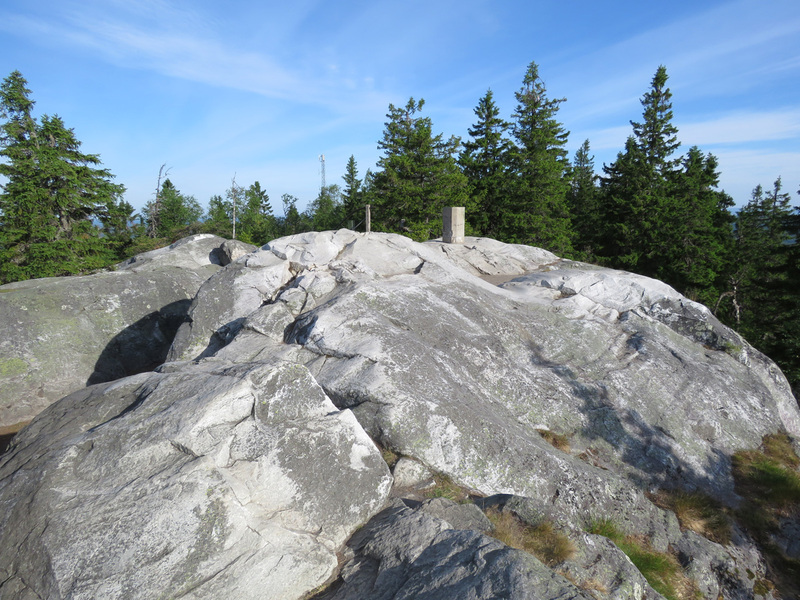 They were open for four hours, but I suppose it’s not very probable to have thieves on the parking lot of a national park. 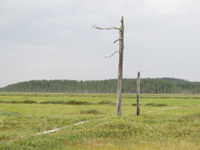 I drove to the southern parking lot of the national park, because that side has more bog. The photo shows a peat drilling sample that is on the parking lot. 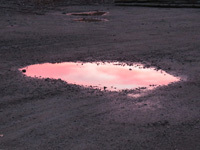 I left the rain gear in the car, because it looked like it wouldn’t rain. 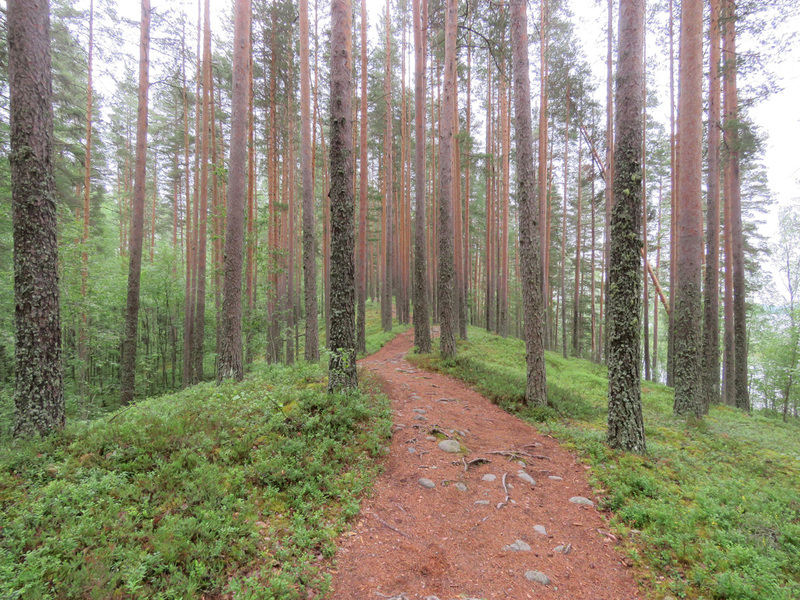 I walked two paths, both were about two kilometres. 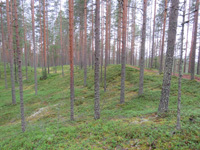 The first one had similar esker forest as on the other side. 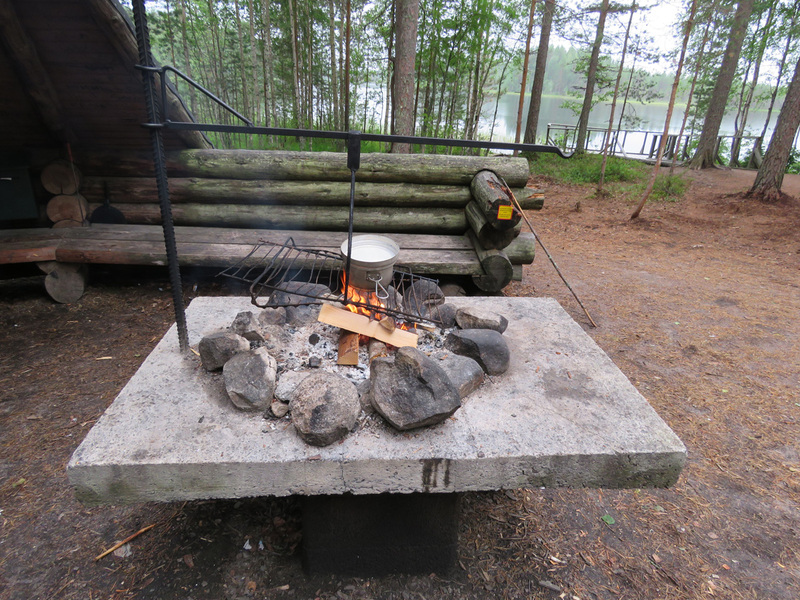 Just before coming to Harjujärvi campfire shelter, it rained a bit for a short while. 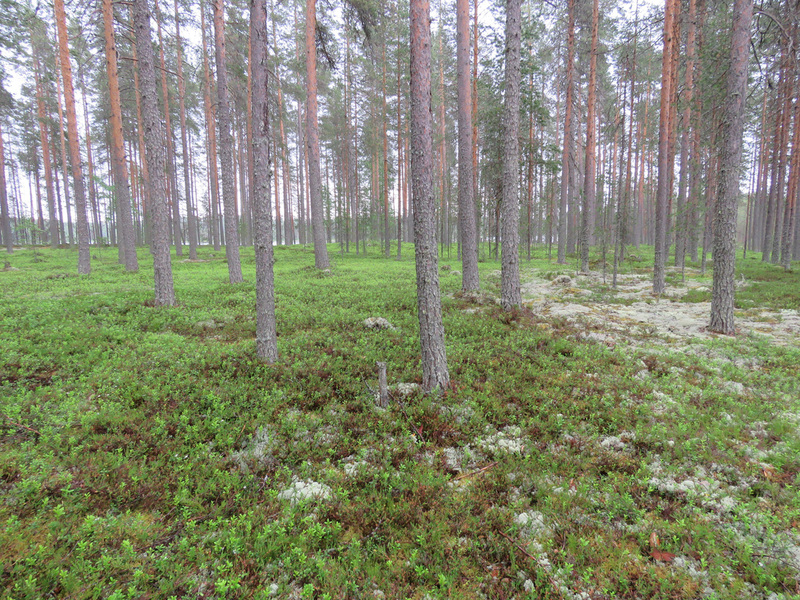 Standing under a tree was enough shelter. 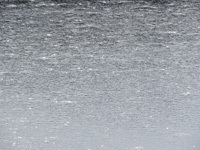 It looked nice when the rain got closer and I could see the drops on the surface of the lake moving towards me. There was no rain while I cooked and ate lunch. 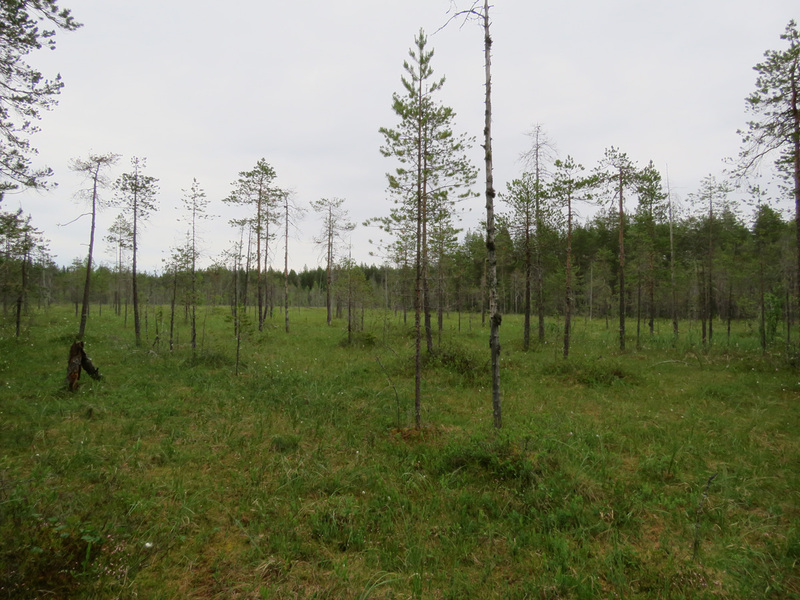 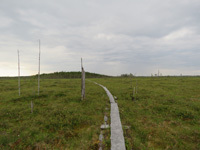 The other path went through Haapasuo bog. 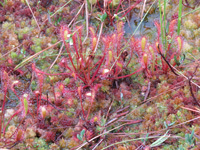 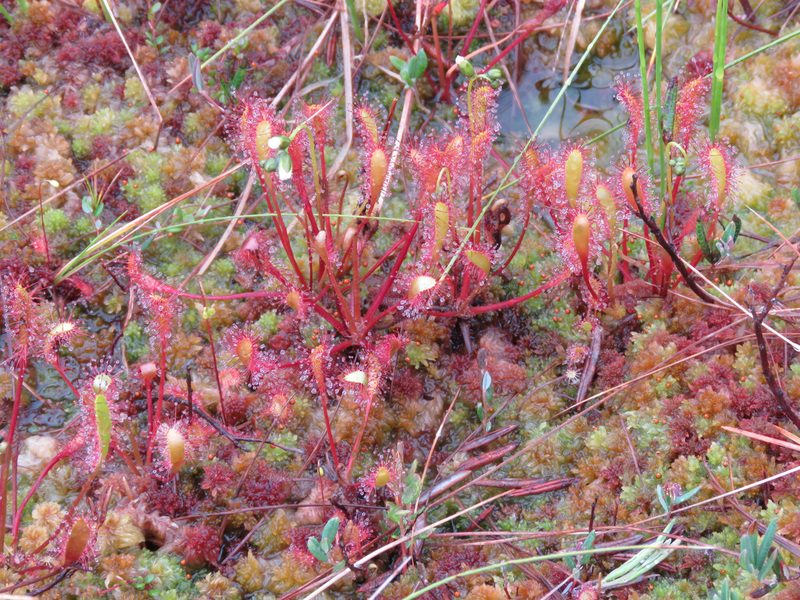 The other photo shows a great sundew (Drosera anglica) with flower buds. 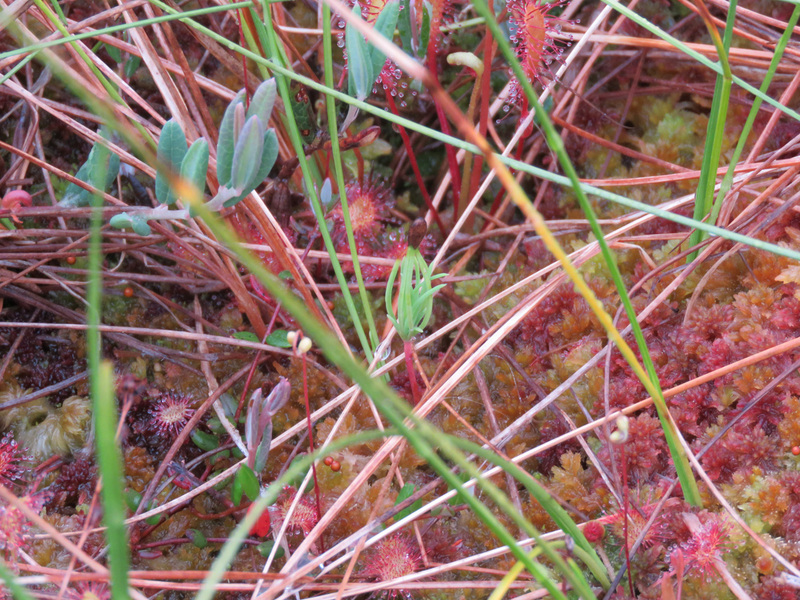 A pine seedling on the bog. 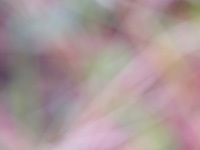 The other photo is the same spot out of focus, just for fun. Scenic tower, view from the top, and a butterfly that was on the rail of the stairs. 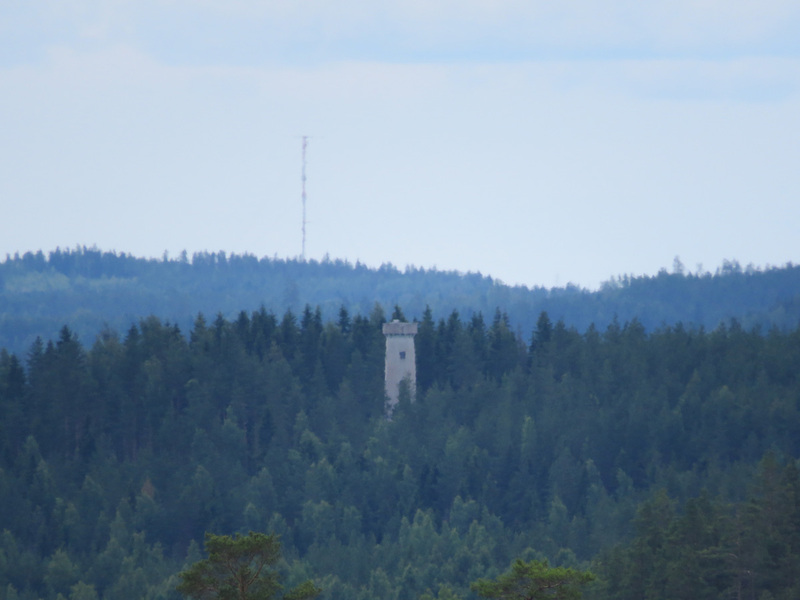 It rained a little again and I waited for it to pass under the tower. 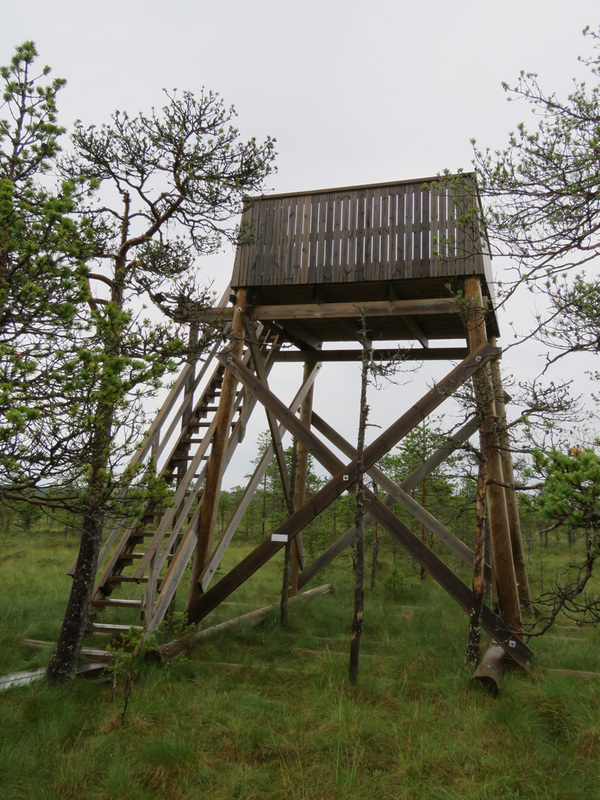 You can’t really see from the tower what kind of net of tussocks the bog is. 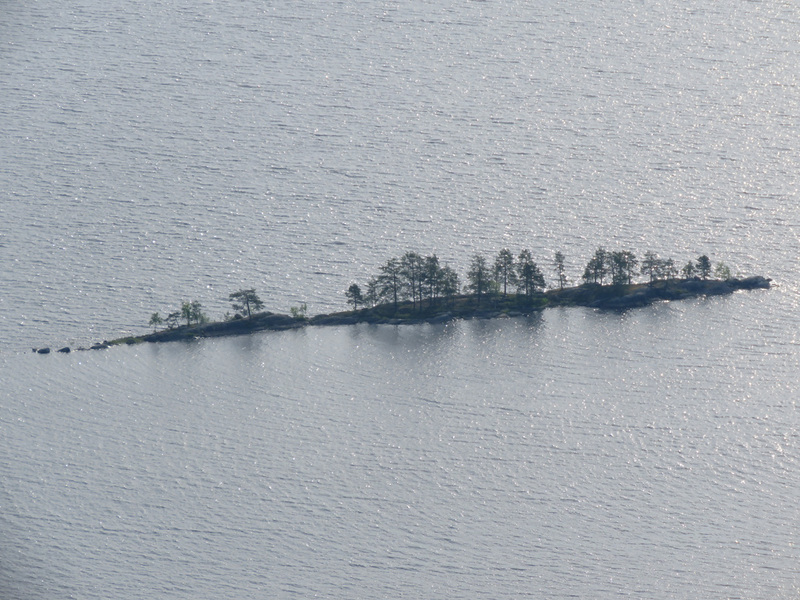 Google Maps aerial image shows it well. 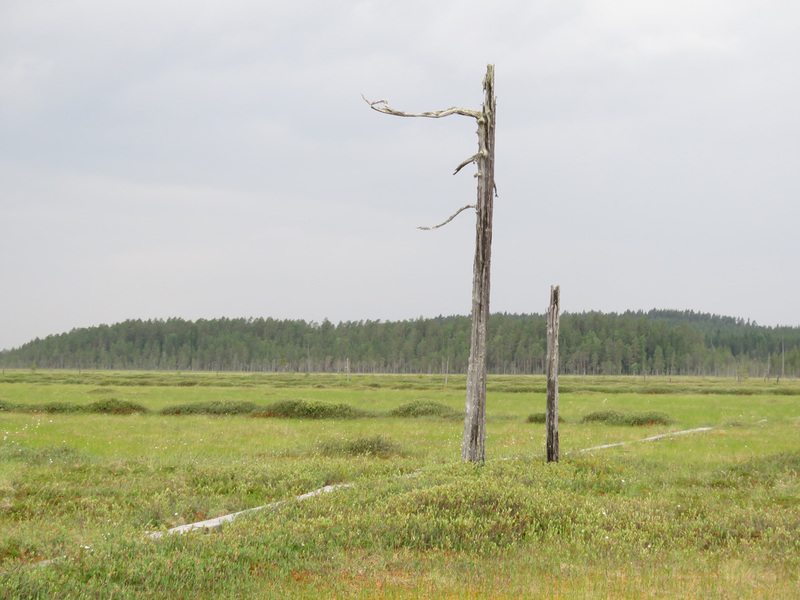 Scots pines (Pinus sylvestris) on the shore of a bog pond. The photo just happens to be upside down and the pines are actually reflections. 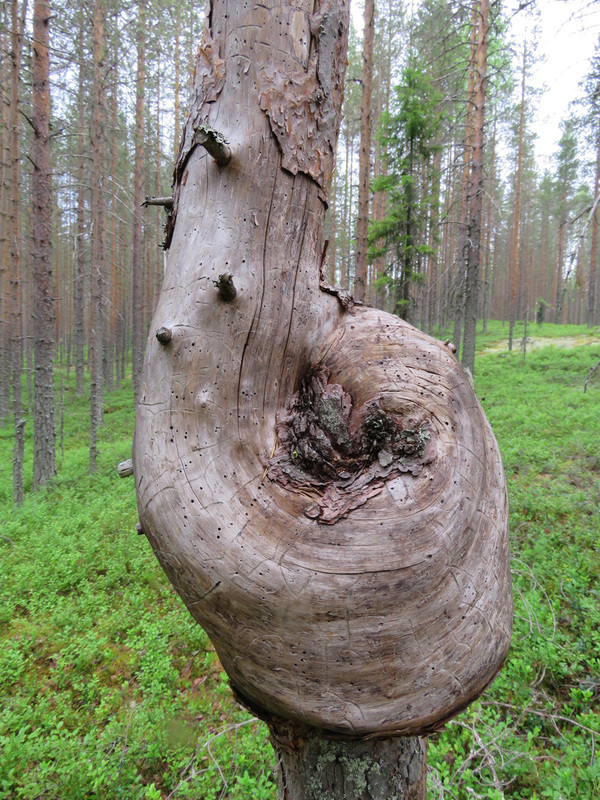 Our planet has a handle. 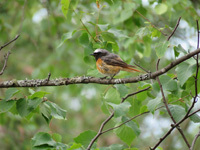 I continued to Heinola to see my mother. I spent one day there before going to Repovesi. 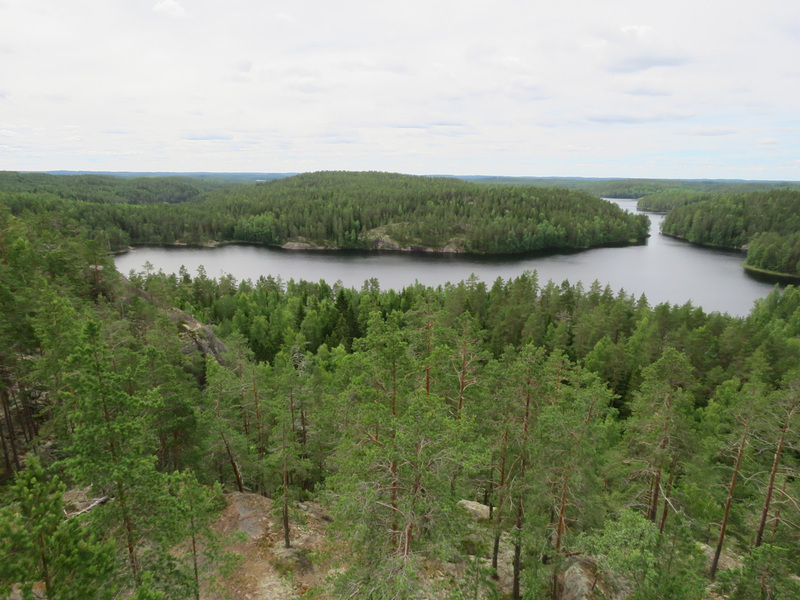 I arrived at Repovesi National Park the next evening. 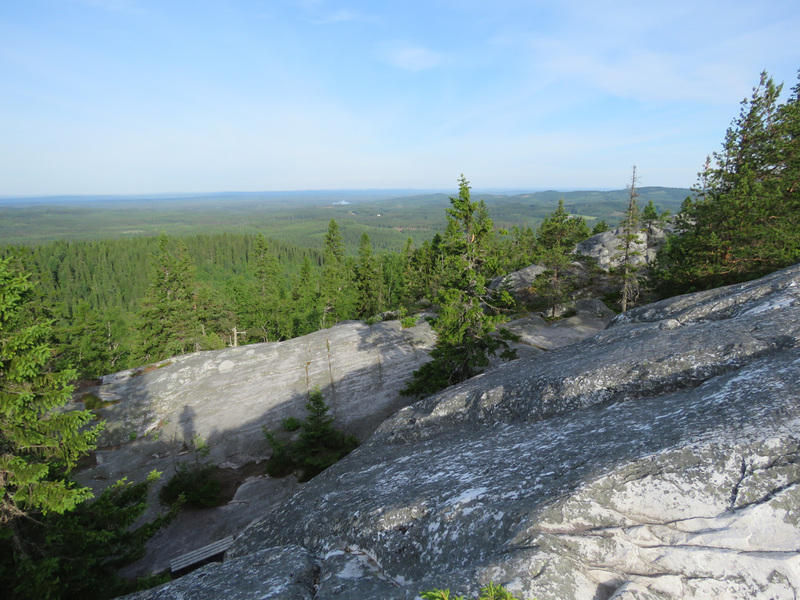 I could see from the size of the parking lot and the number of cars that the place is quite popular. 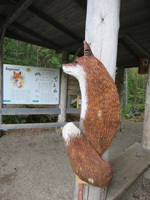 At the entrance there is a fox to welcome you in. The name Repovesi means ‘fox lake’. 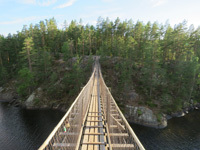 Near the entrance there is a suspension bridge. 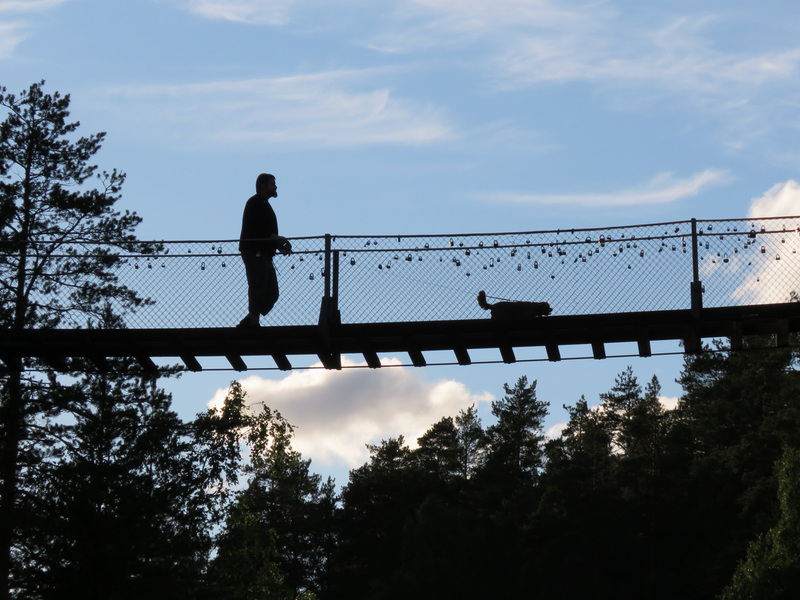 I took a couple of photos of people crossing the bridge at twilight. I put up my tent on the area across the bridge. There were a couple of other tents, and one family was putting up a tent that hangs between trees. 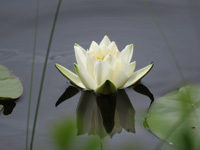 I started to sleep a bit before ten and woke up a bit before seven. 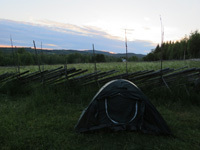 I took the tent back to the car and started walking. 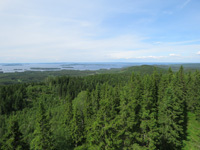 There was a nice view from Katajavuori hill. There was a fallen tree that had balanced itself on another tree so that it was fun to swing it up and down. A waterlily (Nymphaea sp.) 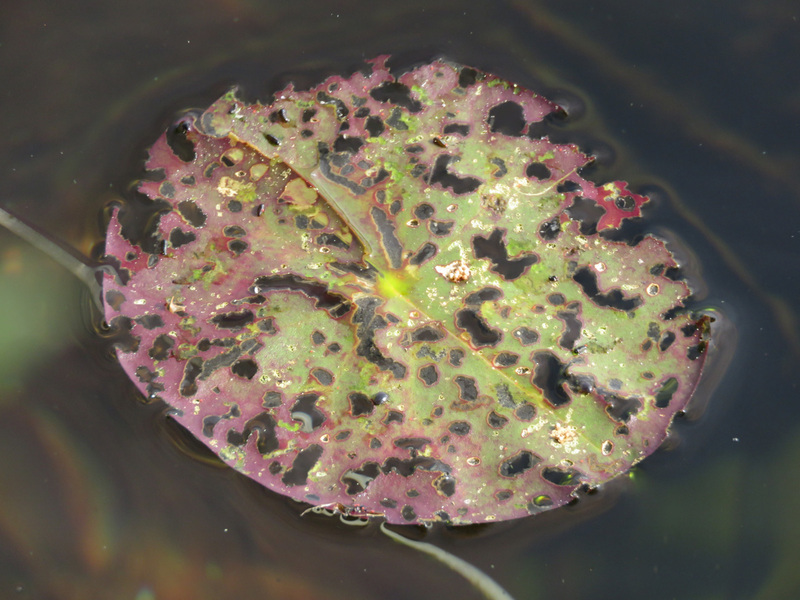 and an insect-eaten lily pad. 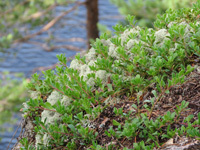 Common bearberry (Arctostaphylos uva-ursi) and lichen. 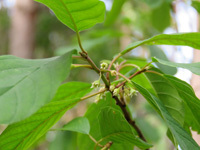 Alder buckthorn (Frangula alnus). 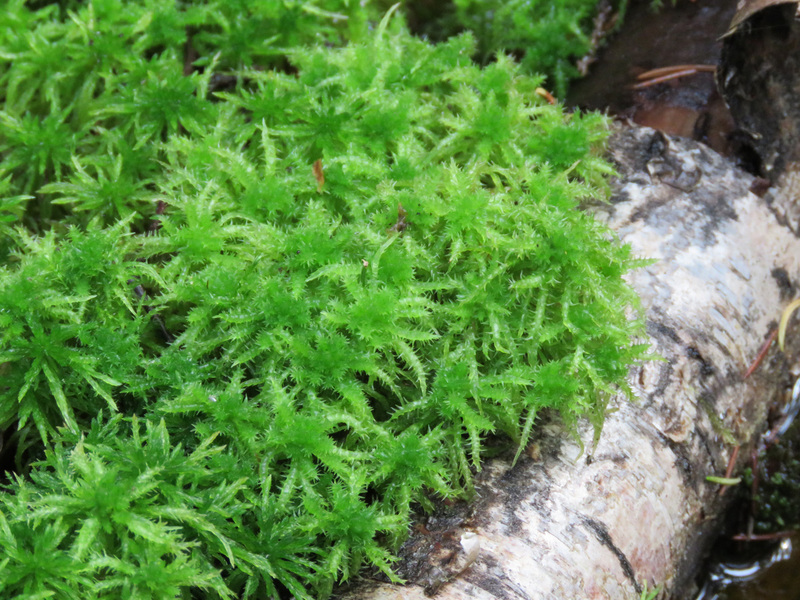 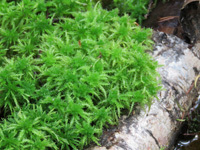 I suppose this is spiky bog-moss (Sphagnum squarrosum). 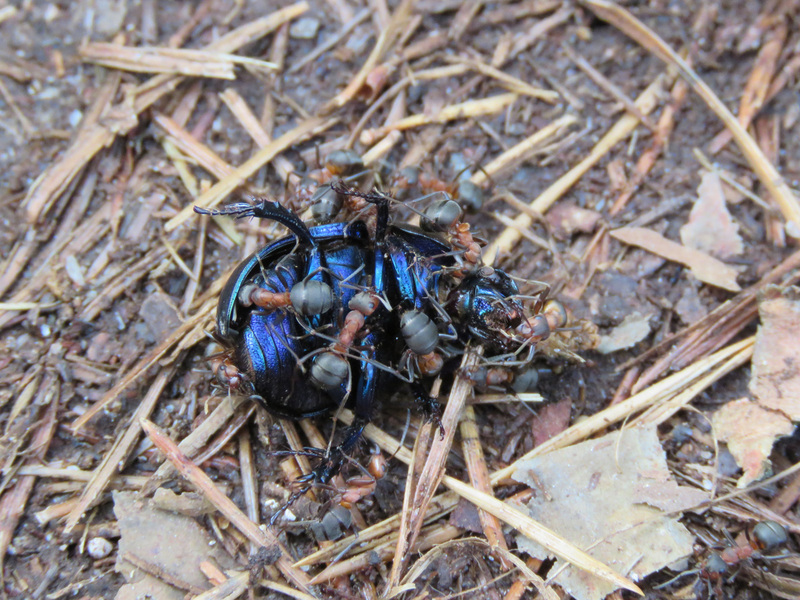 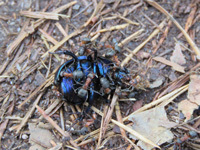 Ants had found a dead beetle. 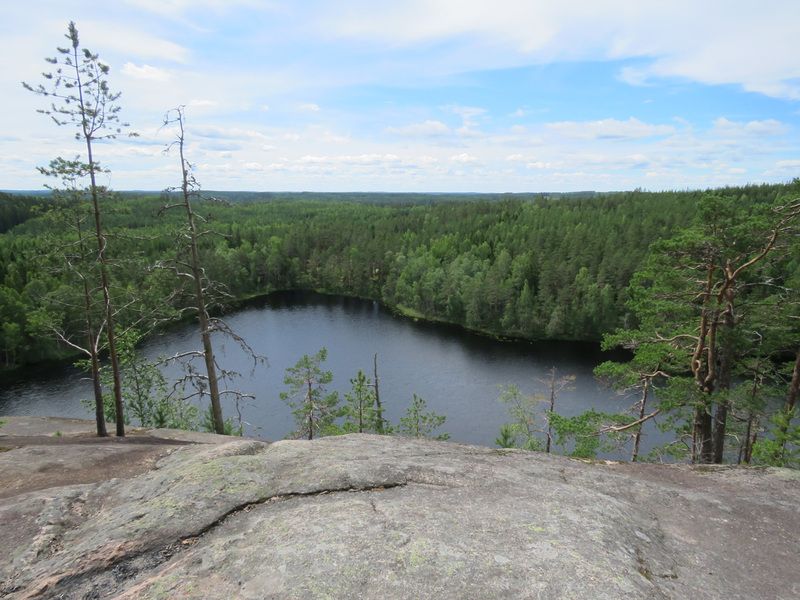 I stopped to eat at Katajajärvi campfire site. There were also a man and his son. 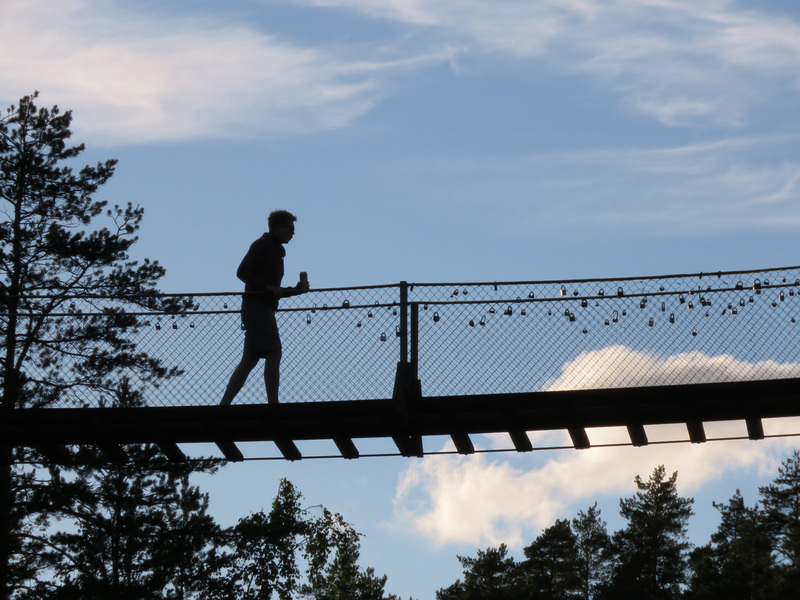 The father was carrying a big water canister around his neck because he didn’t know there were wells in the park. 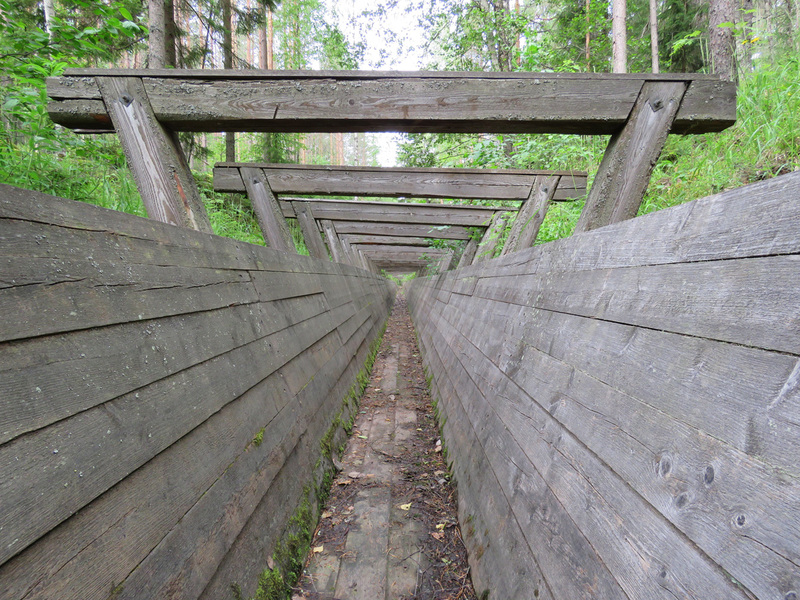 Kuutinkanava (‘seal pup’s canal’) is a 270-metre-long log flume that was built in 1912, first from stone, later from wood. 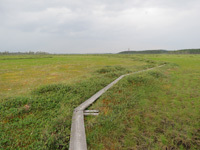 The canal was used until 1968. Common cow-wheat (Melampyrum pratense) and a couple of ants. View from a hill to Kuutinlahti bay. 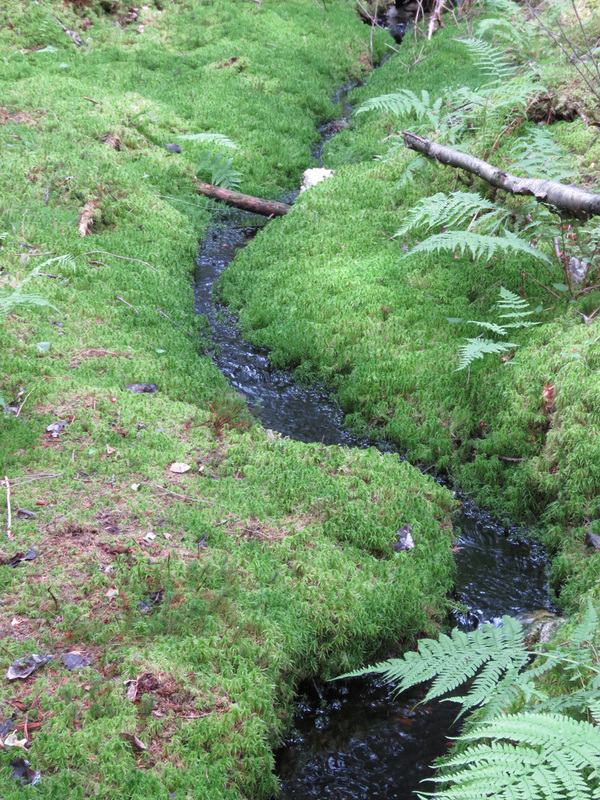 A small brook flowed through the forest. 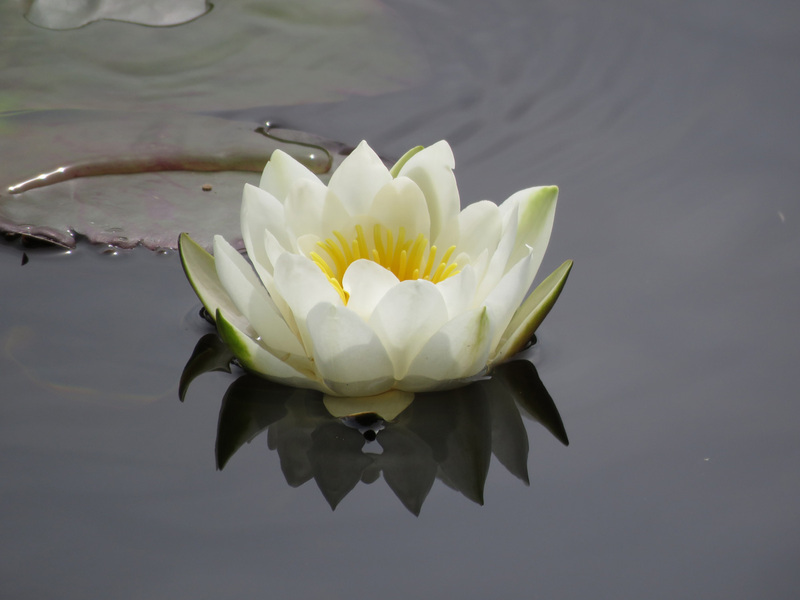 European white waterlilies (Nymphaea alba) and the bud of a yellow waterlily (Nuphar lutea). 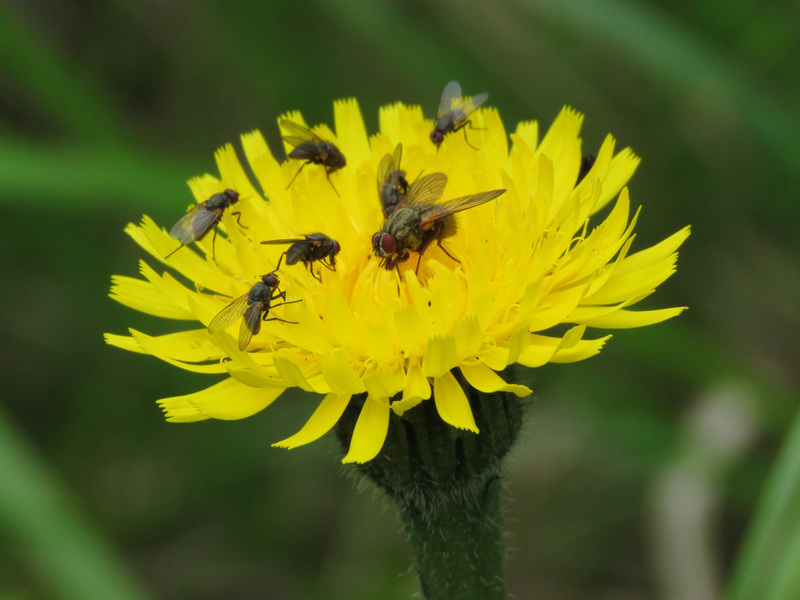 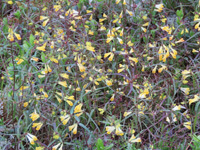 Spotted cat’s ear (Hypochoeris maculata) and flies. 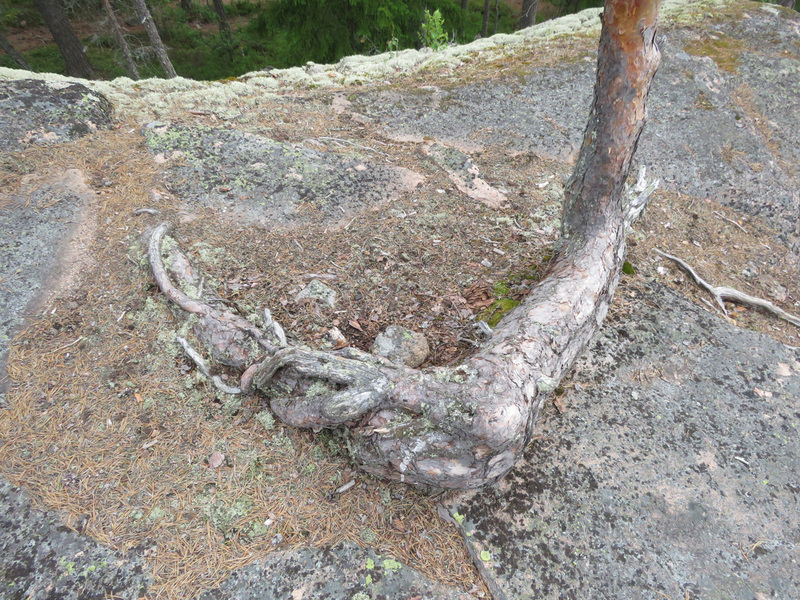 A flat rock and a bent Scots pine (Pinus sylvestris) that grew on it. 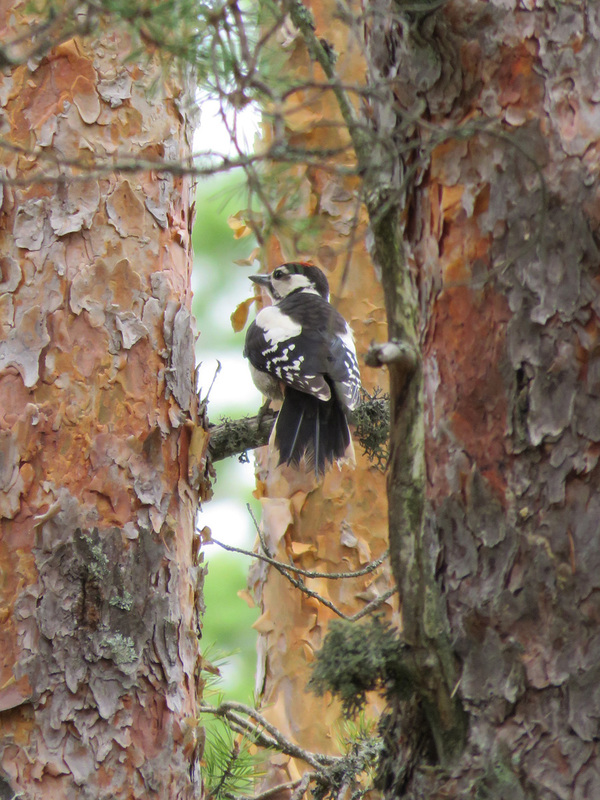 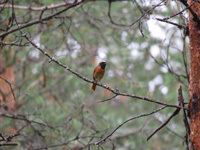 Great spotted woodpecker (Dendrocopos major) and a common redstart (Phoenicurus phoenicurus). 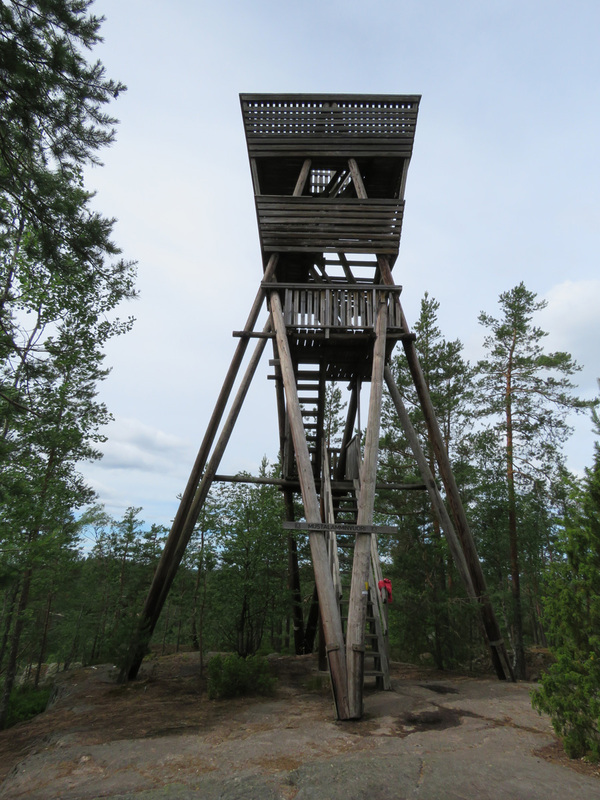 At noon I arrived at the Mustalamminvuori scenic tower. 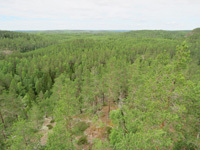 Views from the top. 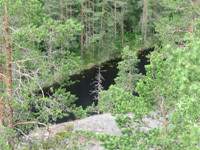 Mustalampi (‘black pond’) was true to its name. 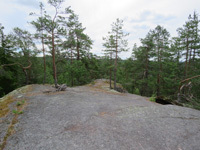 The first photo has Olhavanvuori cliff in the background. 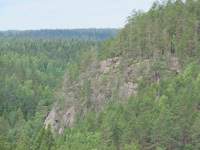 Olhavanvuori cliff nearly one kilometre away and Elving tower nearly four kilometres away. 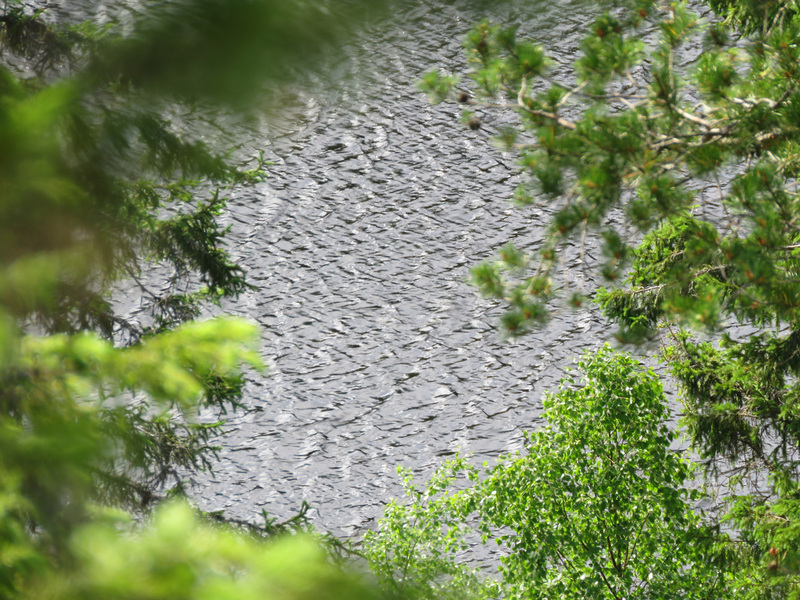 View from Olhavanvuori and the surface of Lake Olhavanlampi zoomed in. Olhavanvuori cliff viewed from below. 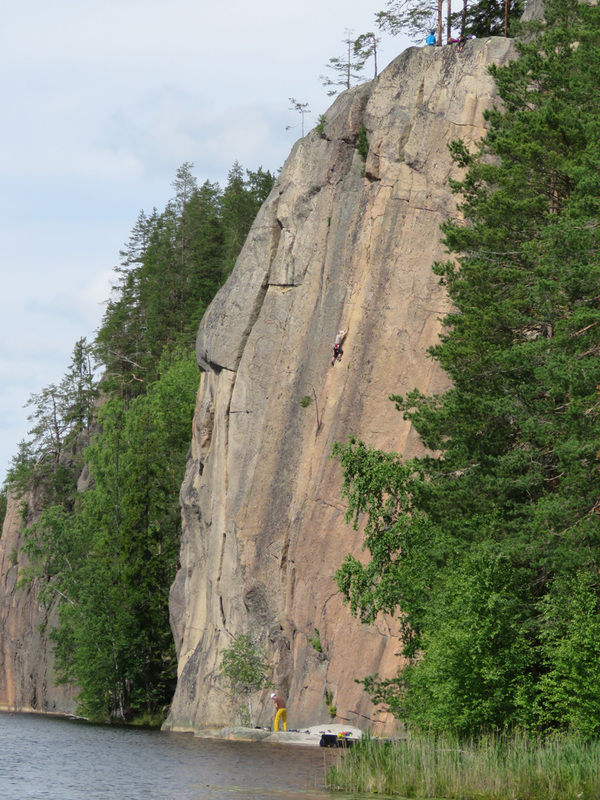 Olhavanvuori and a rock climber. 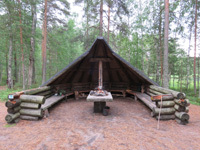 I ate lunch at Olhava lean-to shelter and then went to the Fox Ferry via Talas campfire site. 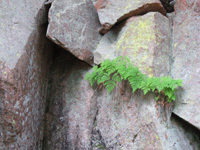 Common oak fern (Gymnocarpium dryopteris) in a crack in the rock. 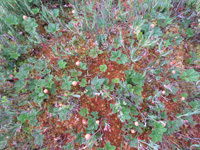 Marsh cinquefoil (Comarum palustre) at Talas campfire site. 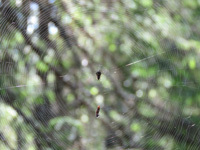 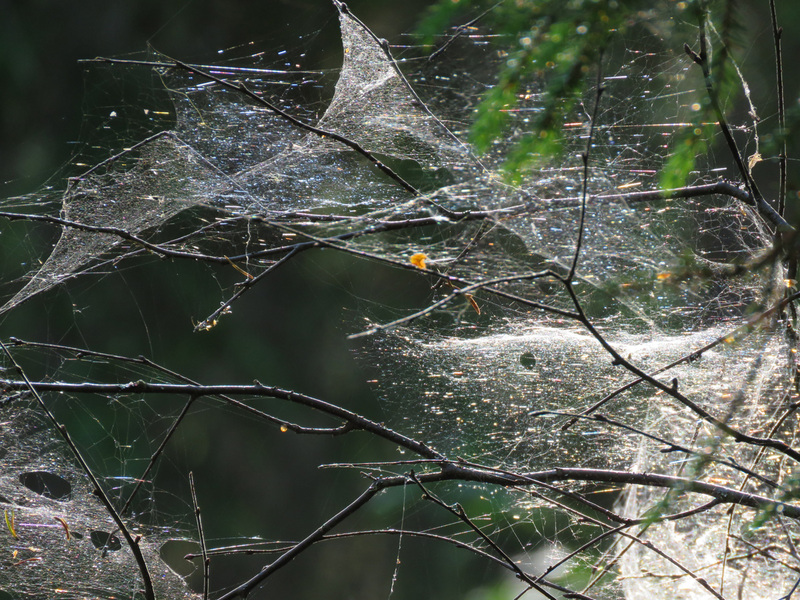 A spider in its big, multi-layered web. 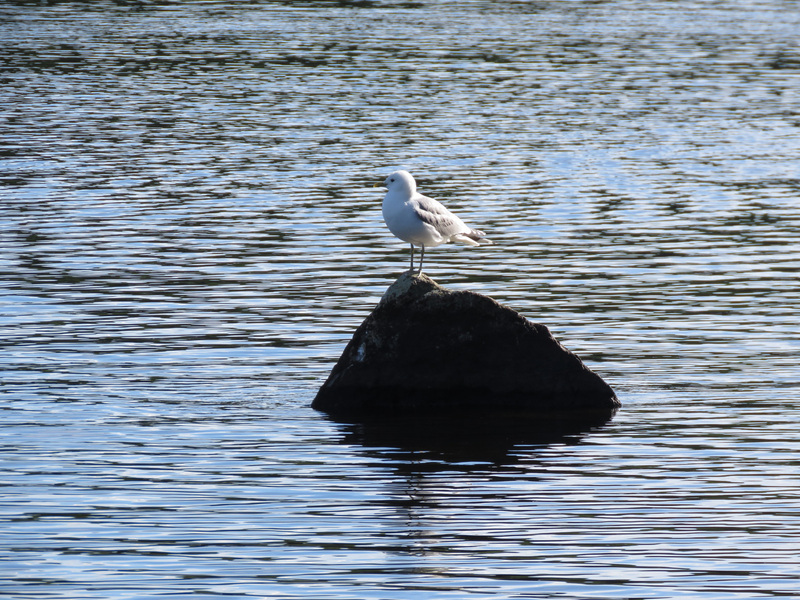 Common gull (Larus canus) at Määkijä campfire site. Fox Ferry. 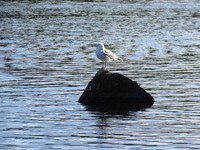 When I arrived, a group of people was just embarking, and I decided to wait so that I’d get to travel across alone. More people came, but I still got the change to pull the ferry across with the rope. It was a fun ride. 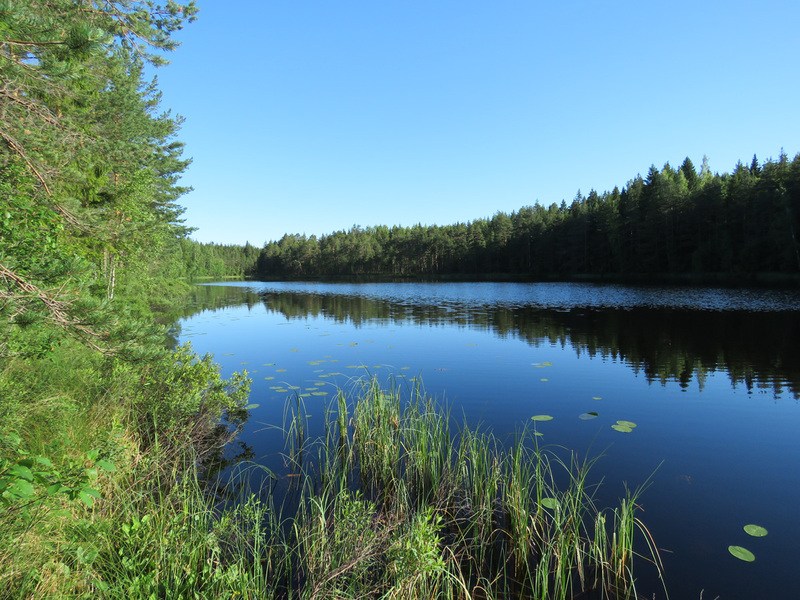 I tried to look for a peaceful spot to go for a swim, but the path was at the lakeshore the whole way. 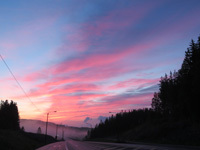 I came to the car a little before seven in the evening. 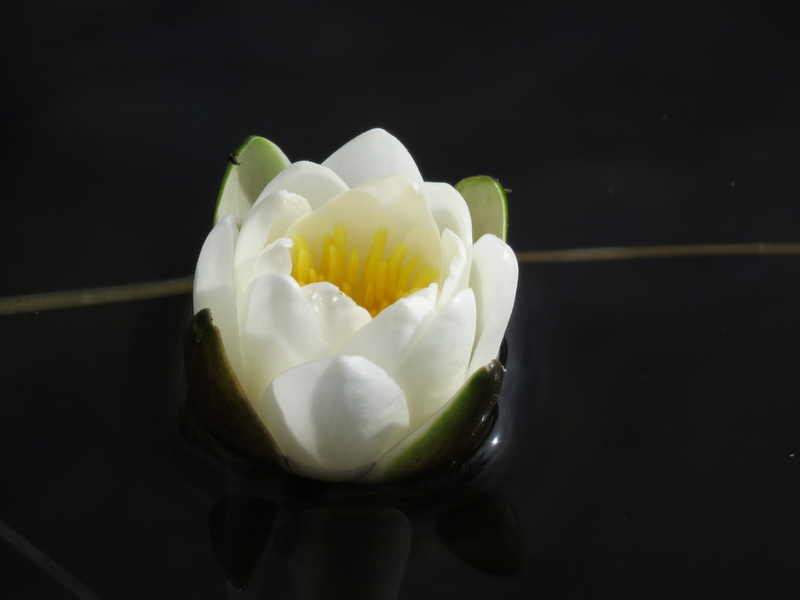 I didn’t want to stay in the same place for another night, so I started driving. 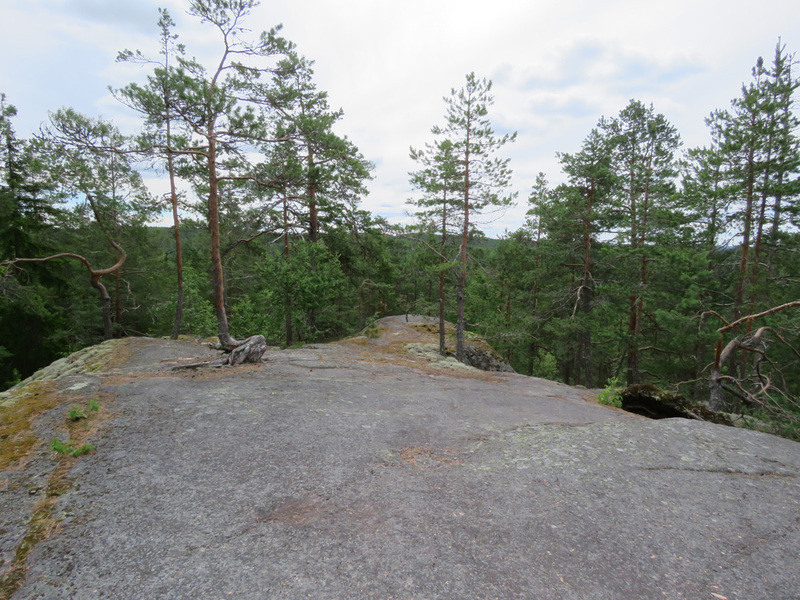 On the map I found a place where I could park my car and hopefully also put up my tent. While driving I was also able to charge my phone whose battery was becoming empty. 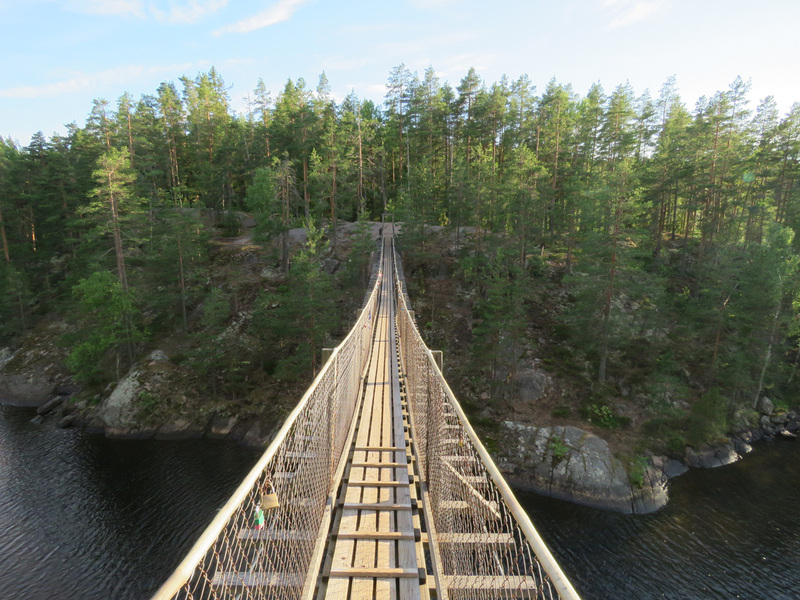 I passed a beautiful bridge and had to make a U-turn so that I could get a better view. 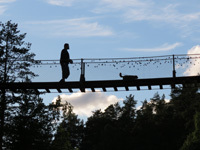 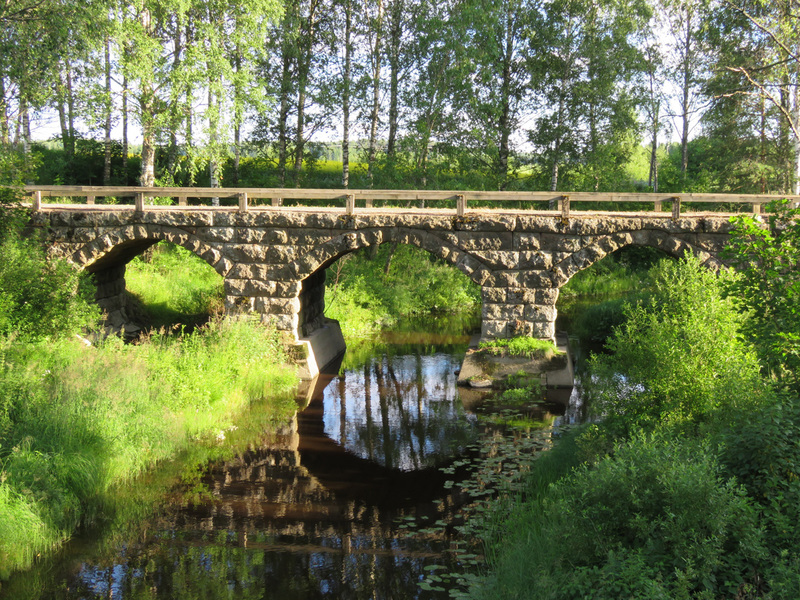 The bridge crosses River Torasjoki at the crossing of Luhtalammentie and Anttilantie roads in Kouvola. On the map I had also seen the beach at Valkeala, and went there for a swim. 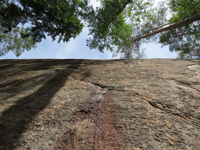 I arrived at Vennalampi parking area along Highway 15 at half past eight. 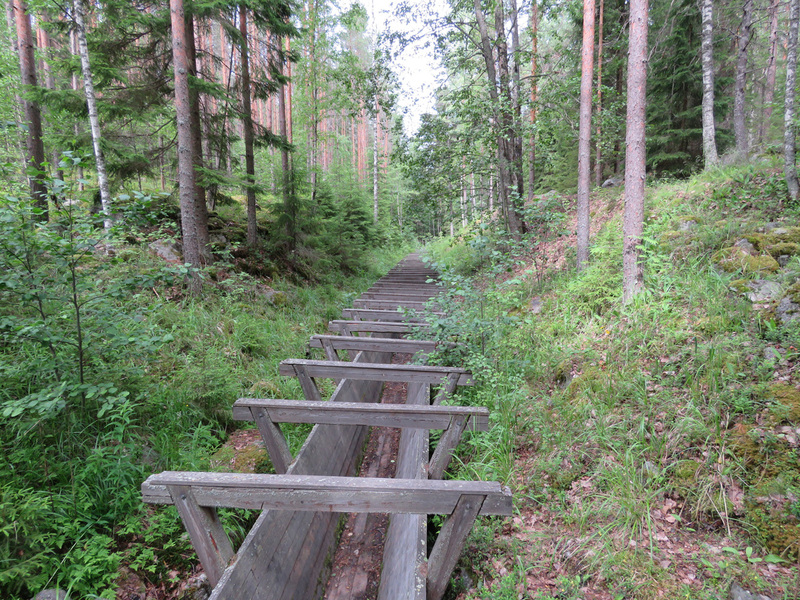 There was a path around Lake Vennalampi. 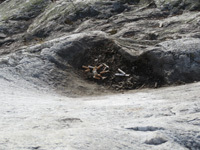 On the side closer to the road there was someone else’s tent (middle photo). 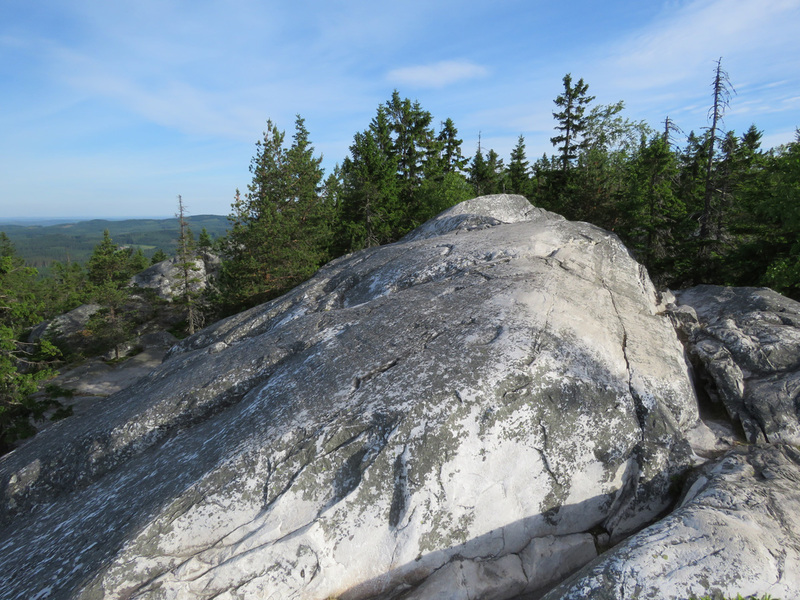 I went to the other side next to an interesting-looking rock formation. 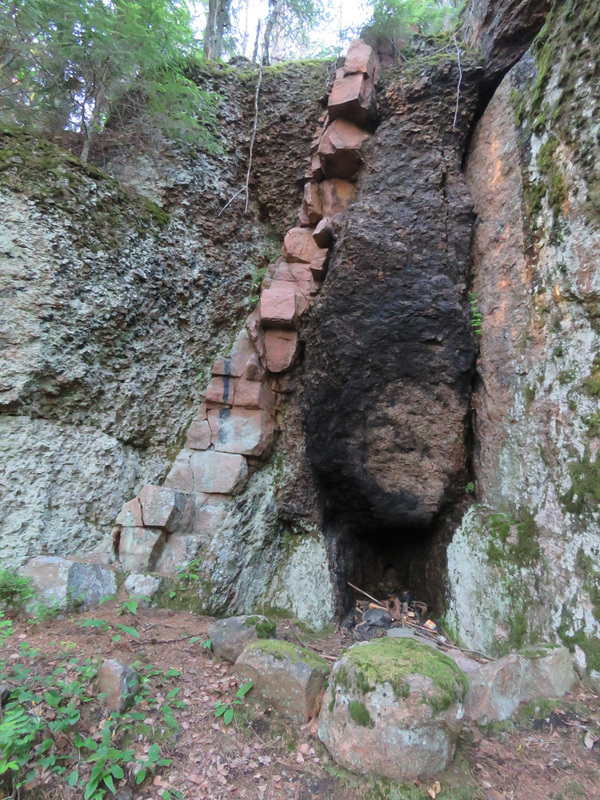 Someone had kept a fire in a hole in the rock. 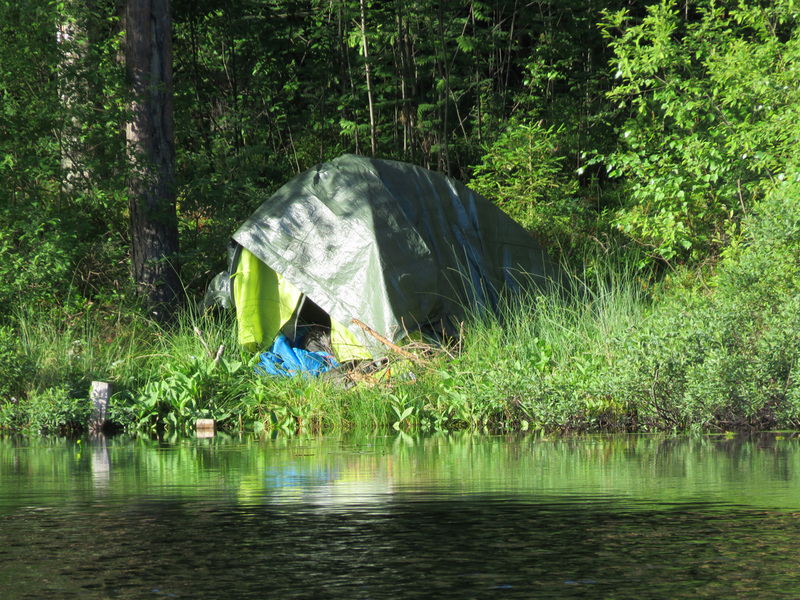 I put up my tent and went to sleep. 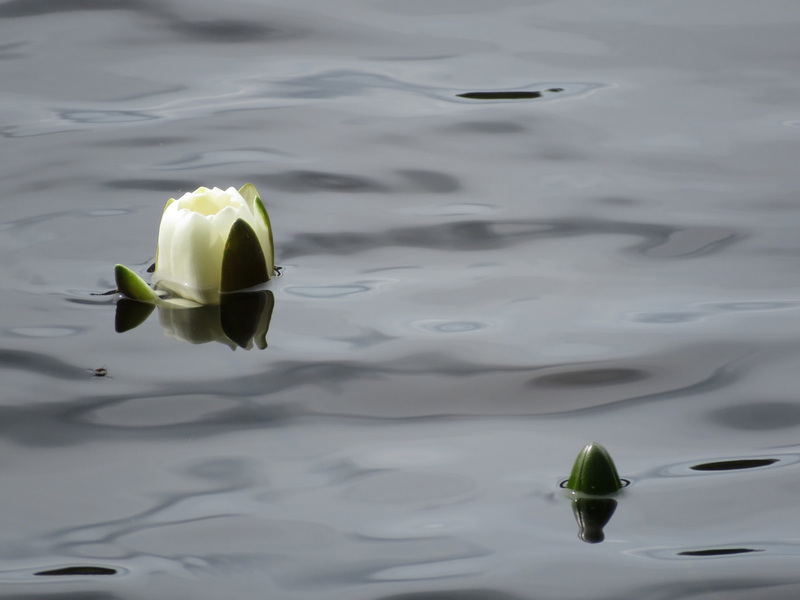 I woke up at seven, tidied up the car, packed my stuff and went for home. 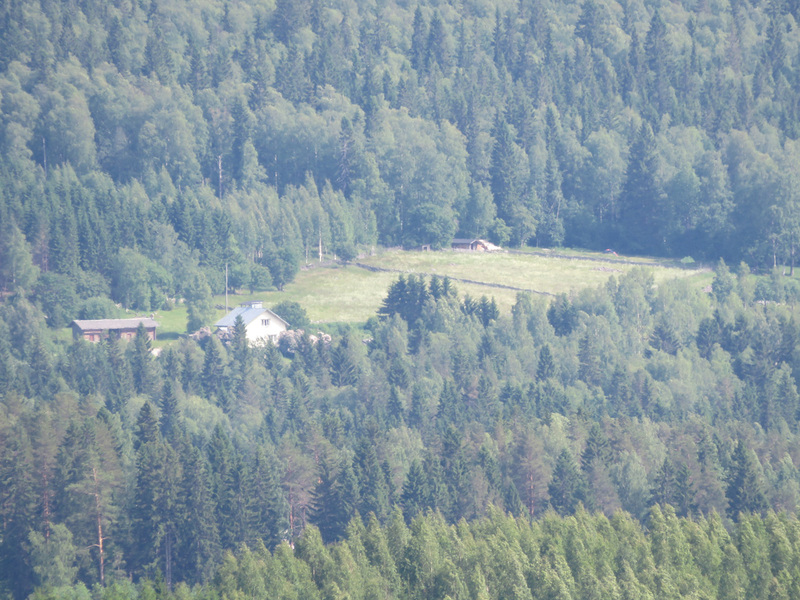 I was home at ten in the morning, unpacked and went to return the car. 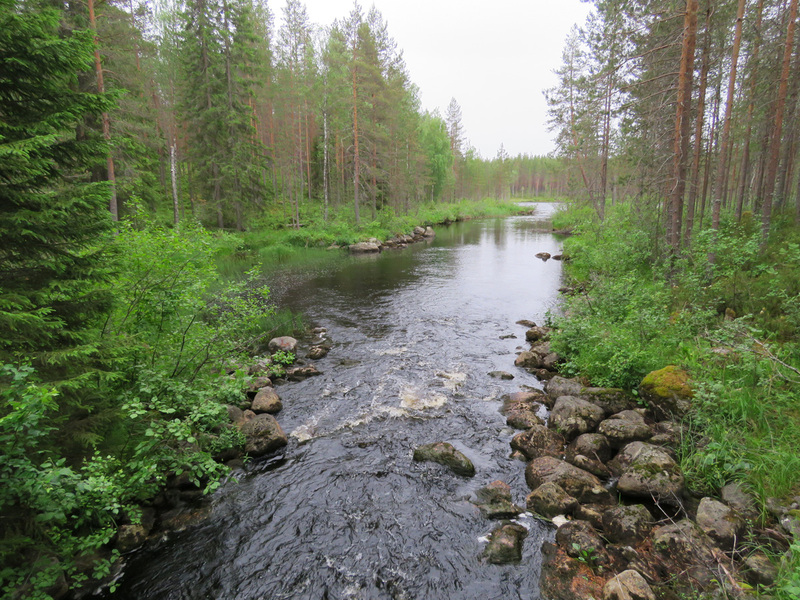 The weather was nice otherwise, but I would have enjoyed Patvinsuo more without rain. 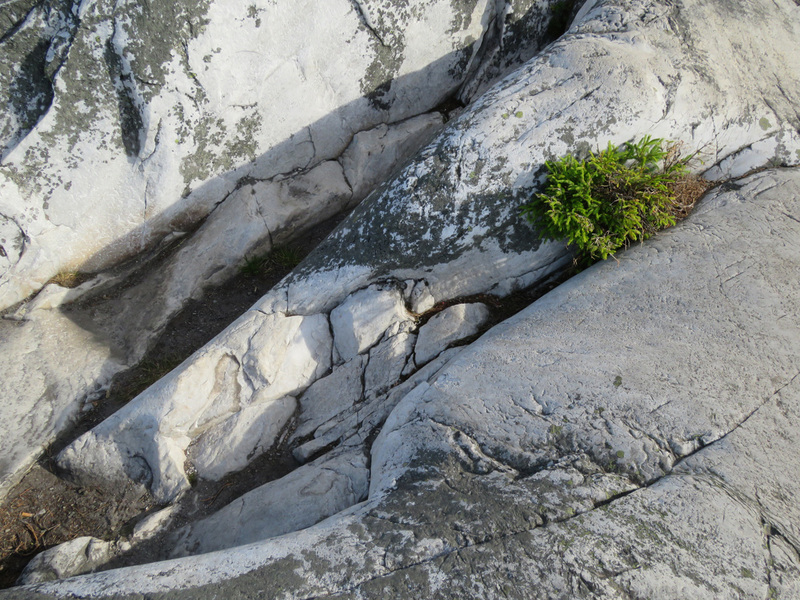 I guess I’ll go there again some day. I didn’t get backache from sleeping in the tent this time. I had a thicker sleeping pad. 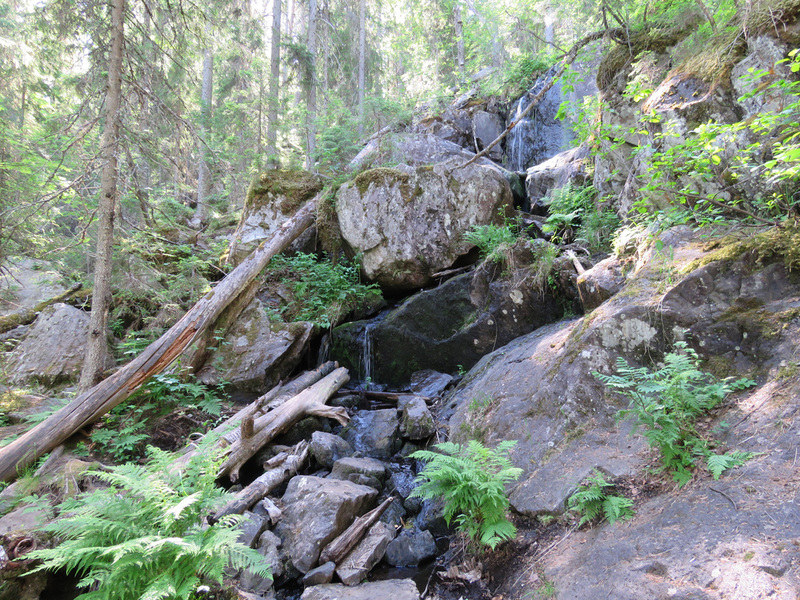 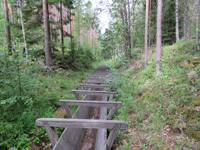 In Koli the paths are wide, even and in good condition. 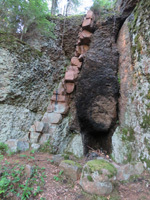 Of course there is a lot of climbing and in some places there are stairs made of rocks which are not easy for people with bad legs. To Ukko-Koli there is also a route without stairs, but I didn’t take it myself. Camping is allowed only in particular places, one of which is near Koli. There are also campfire sites and dry toilets in the national park. 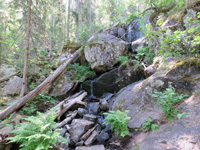 You can get water from the Nature Center and in some camping areas. 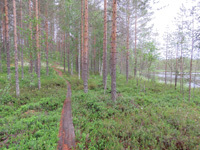 In Patvinsuo the paths are good as well, and there are wooden paths in wet areas. 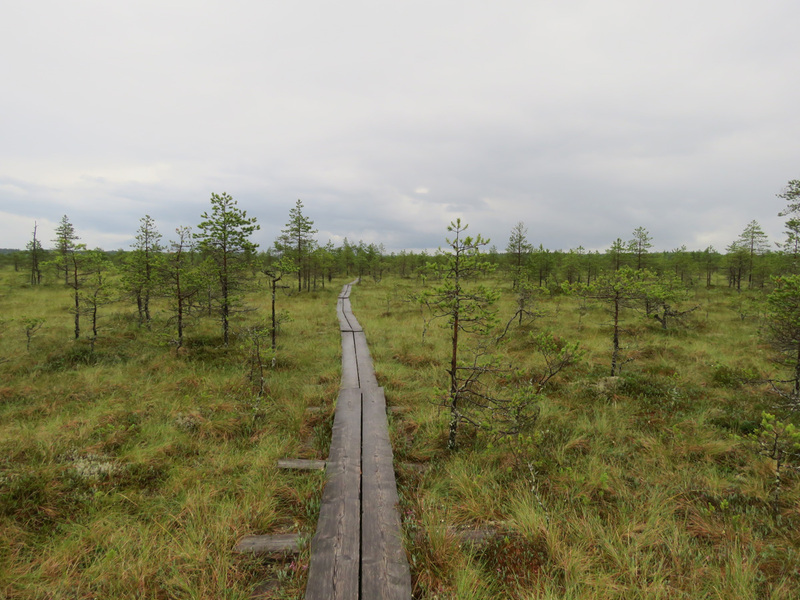 On the bog, the whole path is wooden, except in some forest-covered places. 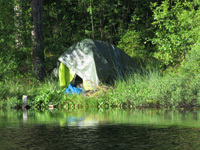 There are camping sites, dry toilets, campfire sites and cooking shelters. 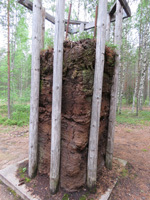 There is a well at Suomu camping site. 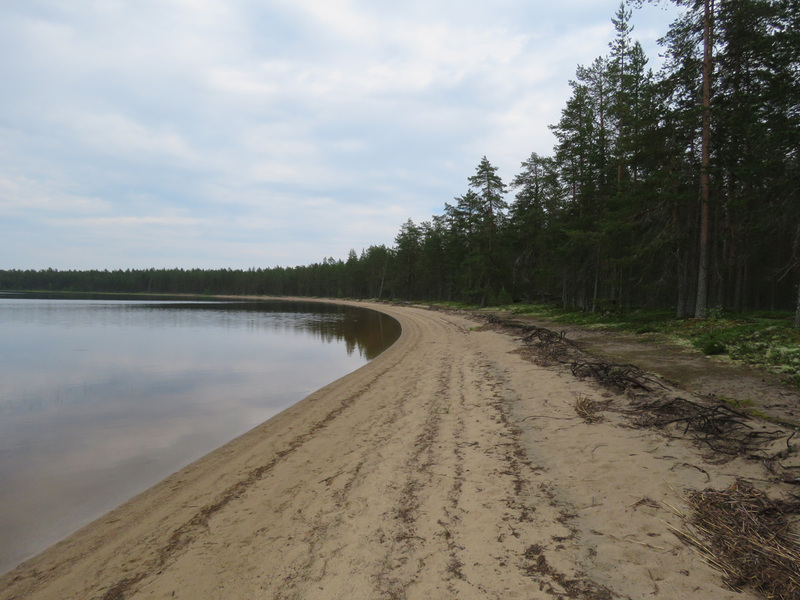 The sandy beaches around Suomunjärvi Lake are amazing. In Leivonmäki National Park there are a acouple of camping sites, lean-to shelters and dry toilets. 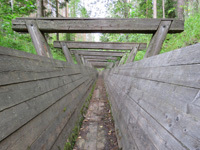 There is no well. 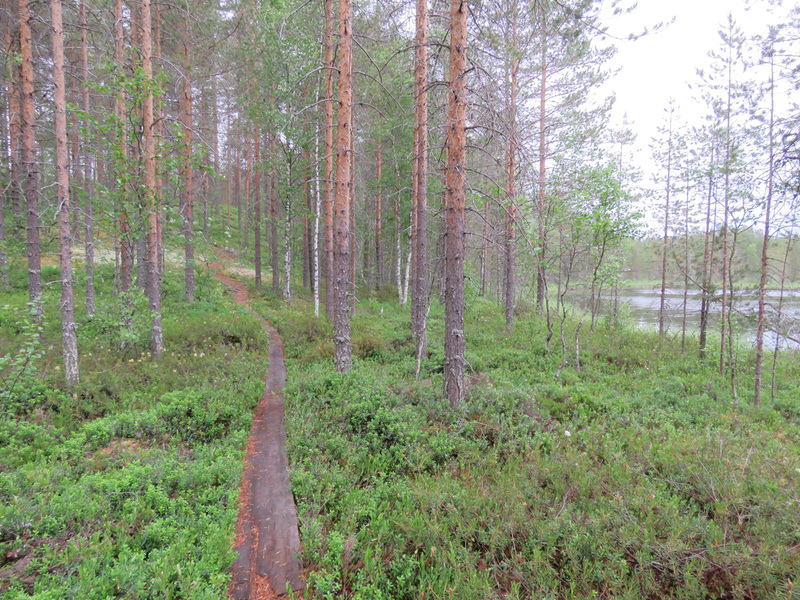 The paths are in good condition. 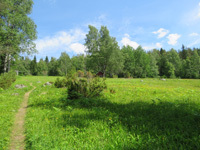 The path to Harjujärvi Lake and the campfire shelter there along with the dry toilet and woodshed are suitable for people with disabilities. 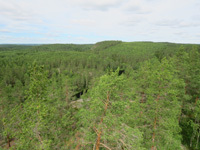 In Repovesi National Park the terrain is hilly. 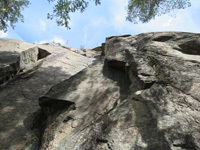 The paths are good but there is a lot of climbing. The steepest places have stairs. Camping is allowed for short periods near specific campfire sites. 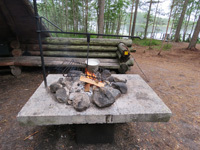 The campfire sites also have dry toilets. 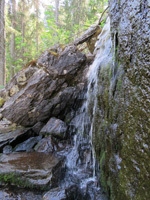 There are several wells in the national park, but the water quality can vary. 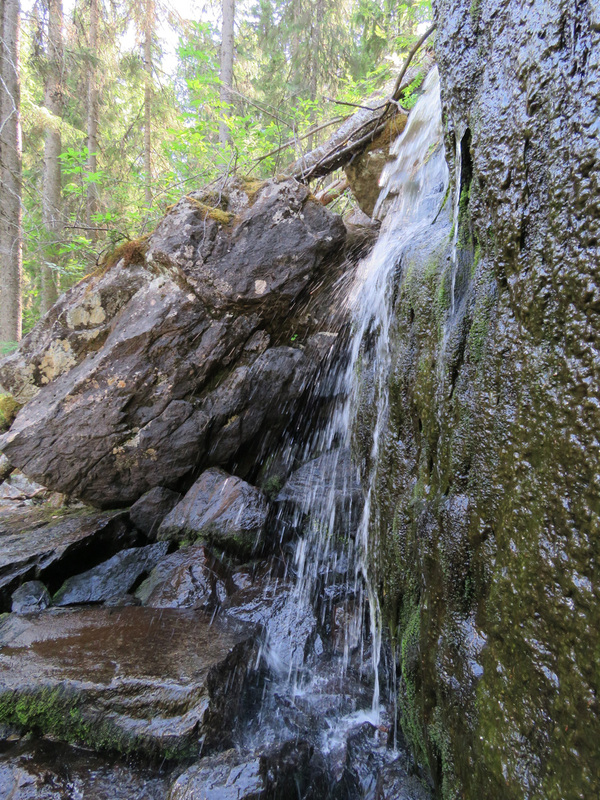 While I was there, both Kuutinkanava and Olhava wells had good water. 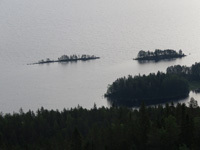 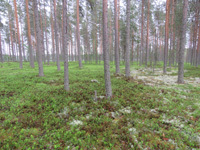 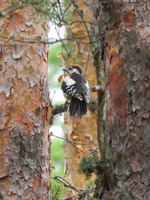 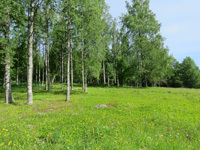 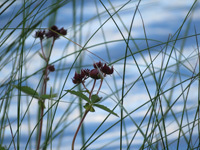 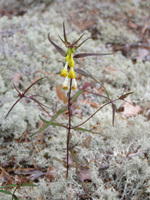 Information about the places: Koli National Park, Arboretum Mustila, Patvinsuo National Park, Leivonmäki National Park, Repovesi National Park.